I was on the road a couple of weeks ago checking my computer when my I-Spy Radar saw an email with a subject line that had something to do with too many fresh eggs and trading cookies for them. 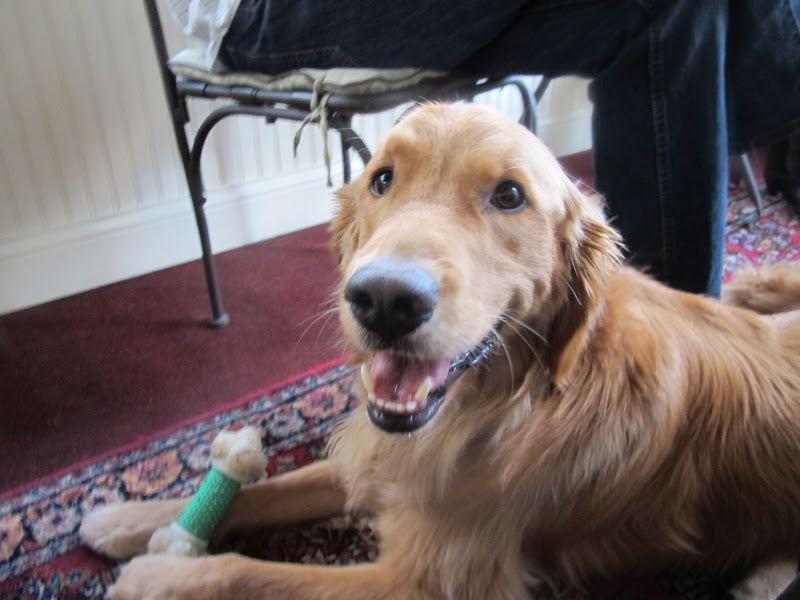 I try and stay off email a lot when I’m away seeing my kids or on vacation, but I couldn’t NOT look at this one. Backyard eggs just hook me right in. And! Cookies fall right out of my oven. 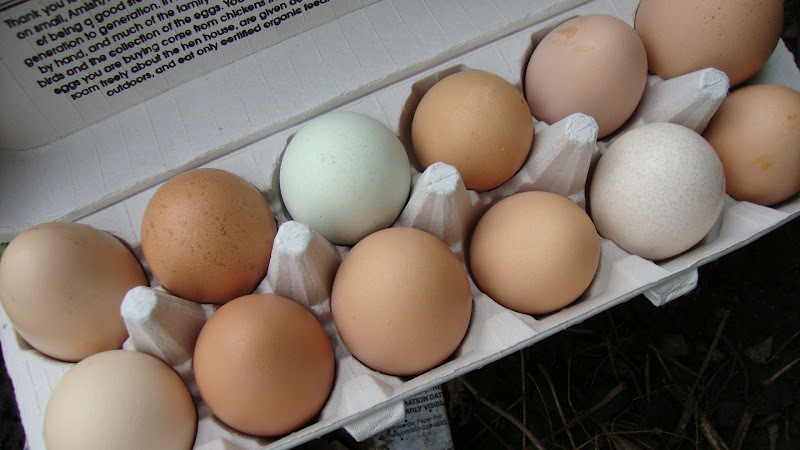 My siblings and I grew up with fresh eggs; my dad either traded produce for them or shelled out a little cash to his Swedish farmer friend Munson. 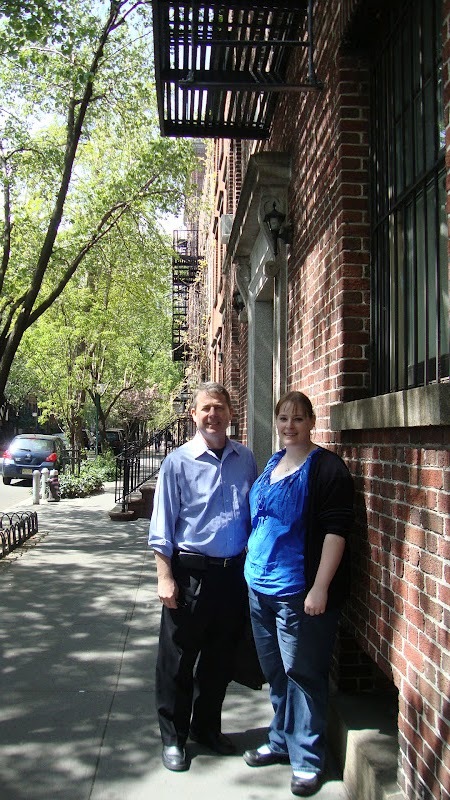 When our parents retired and took it (ha!) easy on a little “hobby” farm, they had their own chickens and, hence, their own eggs, to say nothing of a garden that produced tomatoes the likes of which I’ve never again tasted. 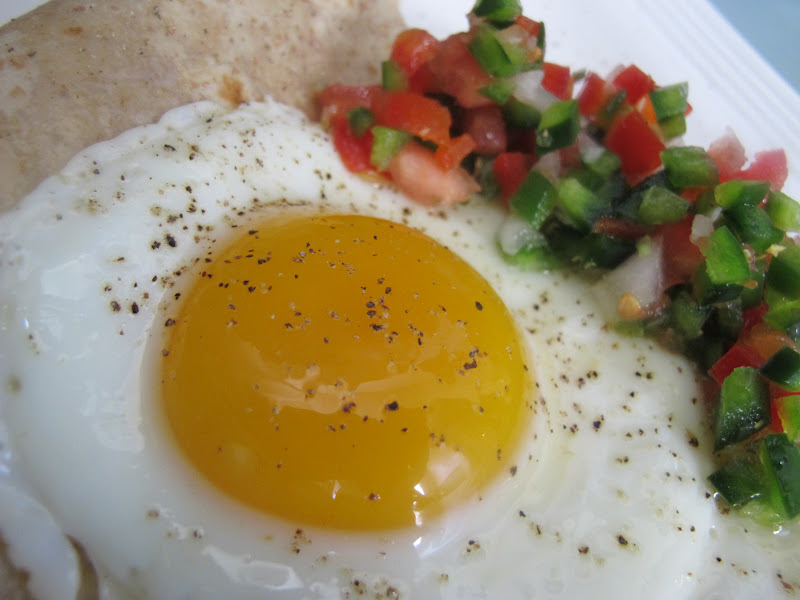 When Dave and I visited as newlyweds, we had fresh eggs (fried in bacon or sausage grease) every morning early. Why would you want anything else? And why not at 6am? There, of course, were also biscuits. With sour cream and honey or molasses. Unending pots of coffee. 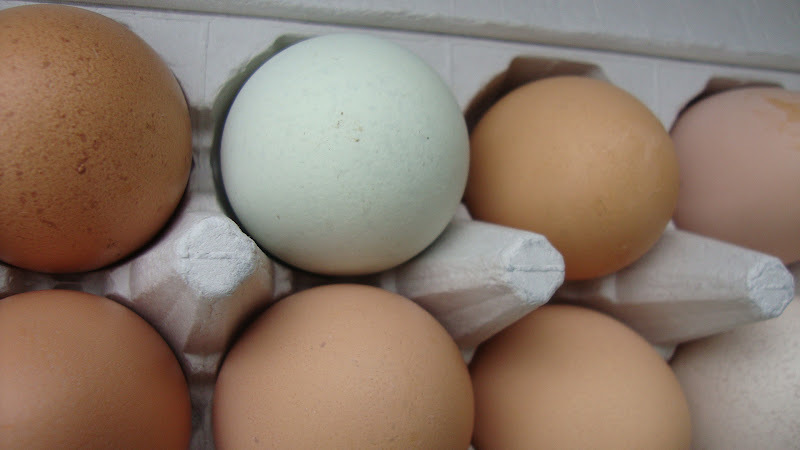 To say that mass-produced eggs pale in comparison is an apt description. 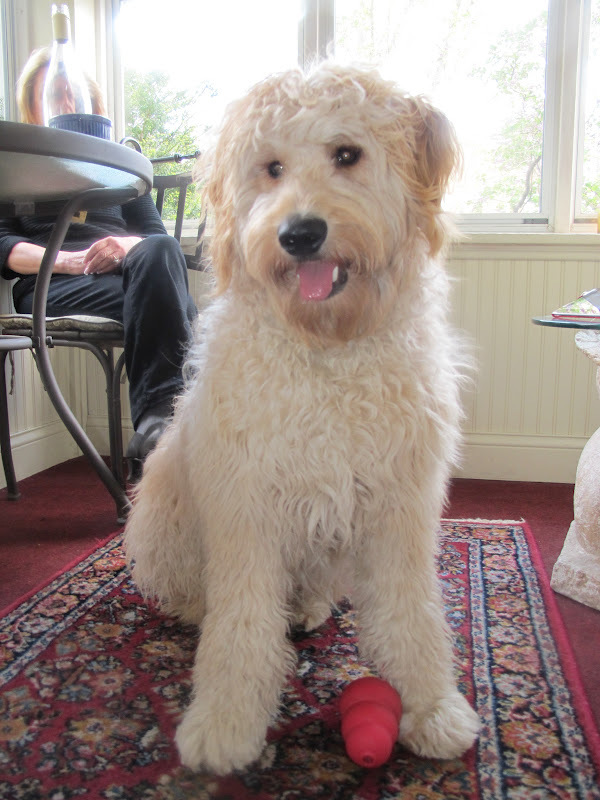 Don’t you love the looks of this egg produced by one of Cathy’s ladies? This week I made granola for Dave, so just made a bigger batch and traded that. It’s lovely with milk, better with plain Greek yogurt and a drizzle of honey, and best with homemade ricotta and fresh fruit. Naturally, you can scoop up a little and eat it out of hand. (I do recommend leaving a scoop or spoon in the jar as you’re keeping this granola awhile.) Your choice. Whatever you do, I hope you find someone with whom to trade it so that you can eat eggs like I’m eating! Thanks, ladies. based on David Lebovitz’ recipe, which he says was based on Nigella Lawson’s! Pre-heat oven to 300 degrees F.
I thought I’d share the differences between my granola and David Lebovitz’–his included 3/4 cup brown sugar (I skipped that) and had no fruit at all (I like fruit). But I definitely borrowed the idea of applesauce in place of the large amount oil usually used in granola and part of the reason it’s so caloric. This is very low fat, crispy, tasty, and… well, you’ll like it. If you’ve never visited the magical David Lebovitz blog, please do yourself a favor and make the trip today. David is an American pastry chef living in Paris who always has a great story to tell— The food’s lovely, too, but it’s the stories that bring me back again and again. FYI–David also does things like Paris Chocolate Tours if you ever get to the City of Light. If you want more info, check the blog or ask David yourself in the comment section of his blog. 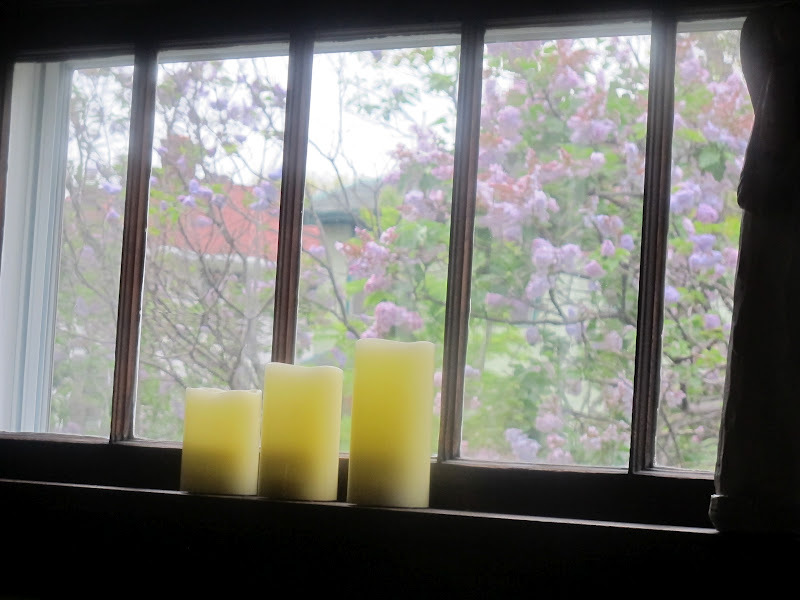 Our lilacs through the piano window. 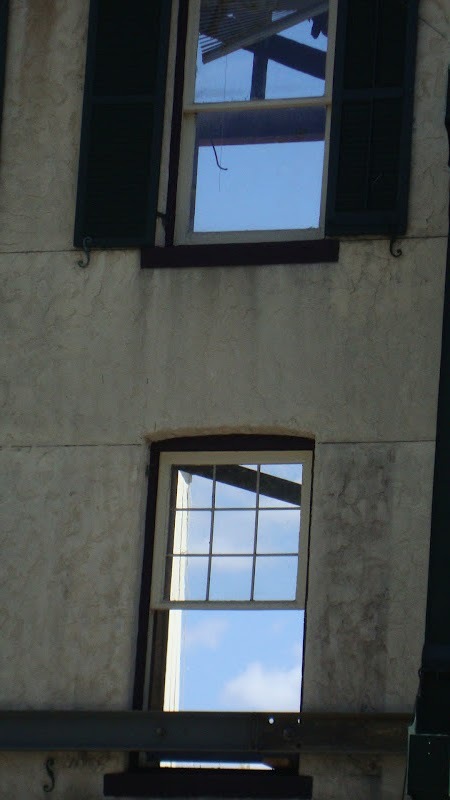 Two views–above and below. Above: Tasting Sean’s brews in Colorado. 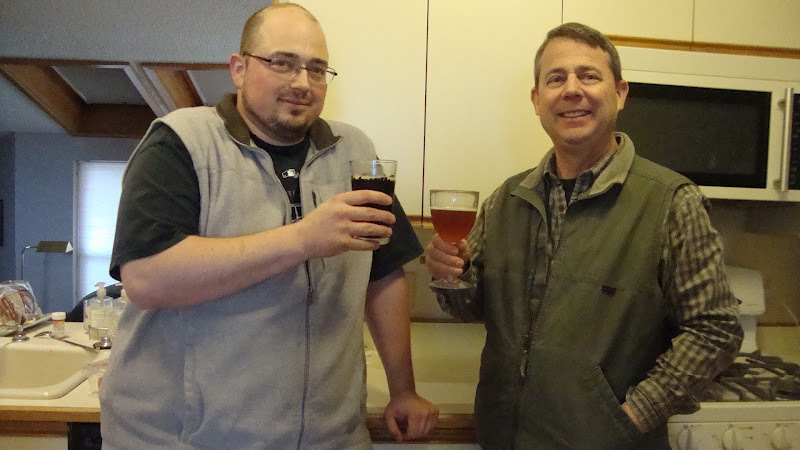 Our son’s on his way to becoming a master brewer. Woo hoo! 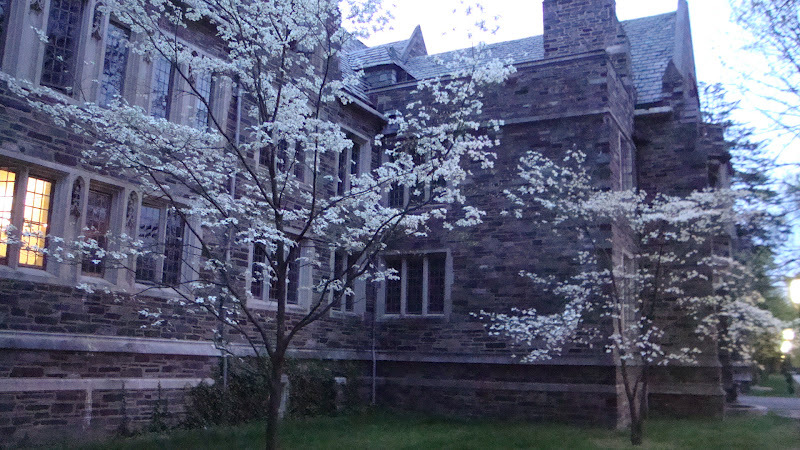 Above: In Princeton–a facade saved, ready for its new building to be built behind. Meantime, you can see the sky! 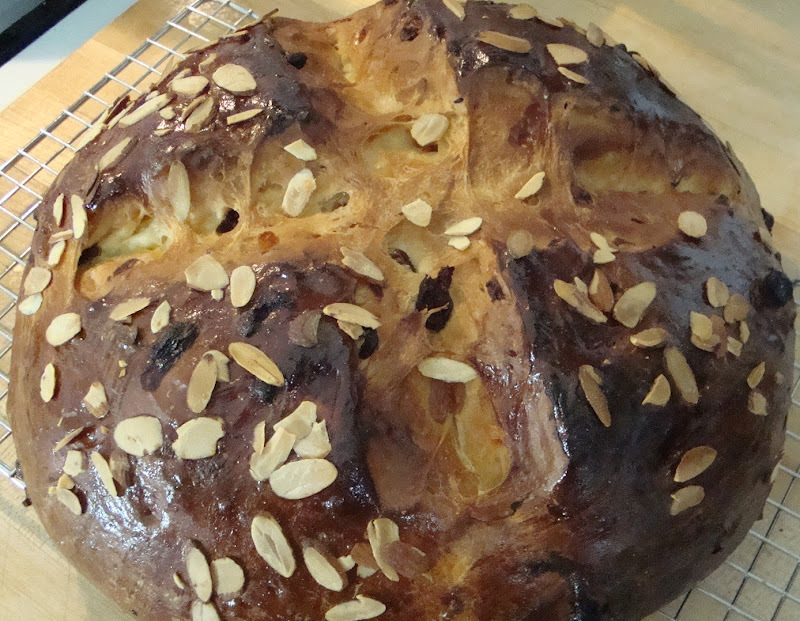 My Easter cake…will blog soon. 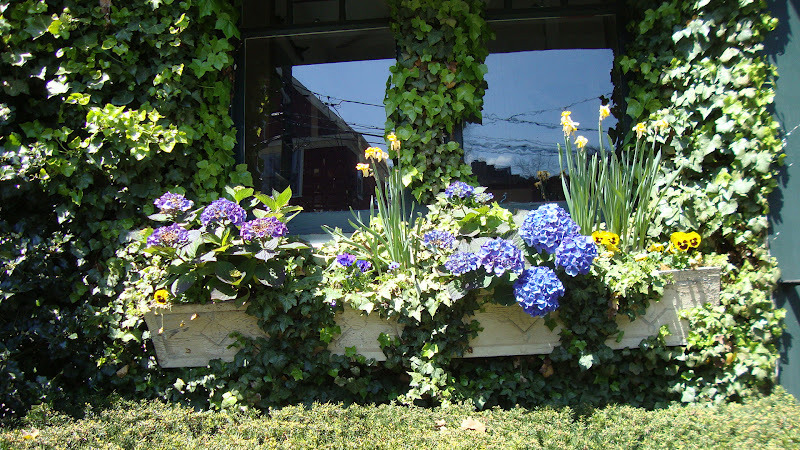 Great for spring! 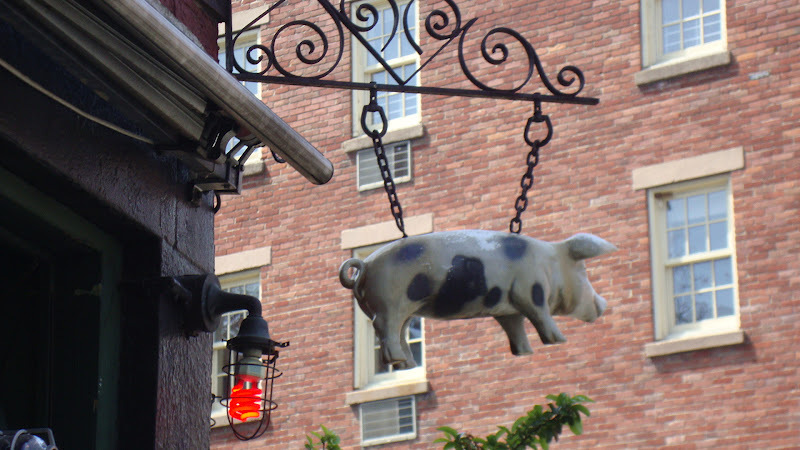 At The Spotted Pig in NYC, April Bloomfield’s restaurant. 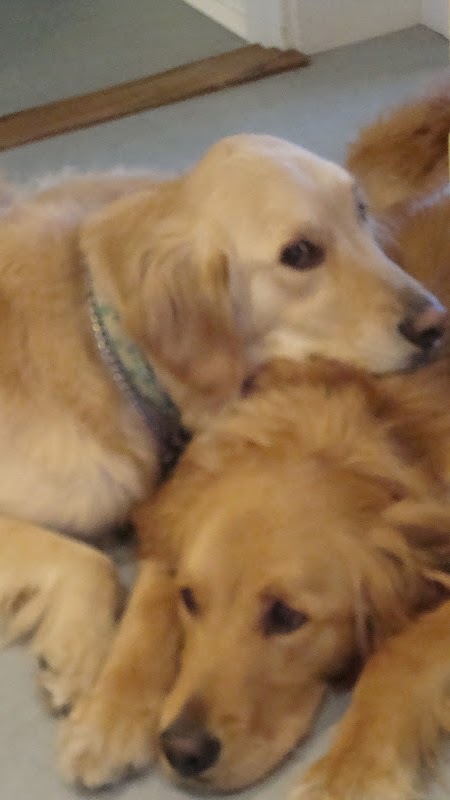 I was on the road a couple of weeks ago and checking my computer when my I-Spy Radar saw an email with a subject line that had something to do with too many fresh eggs and trading cookies for them. 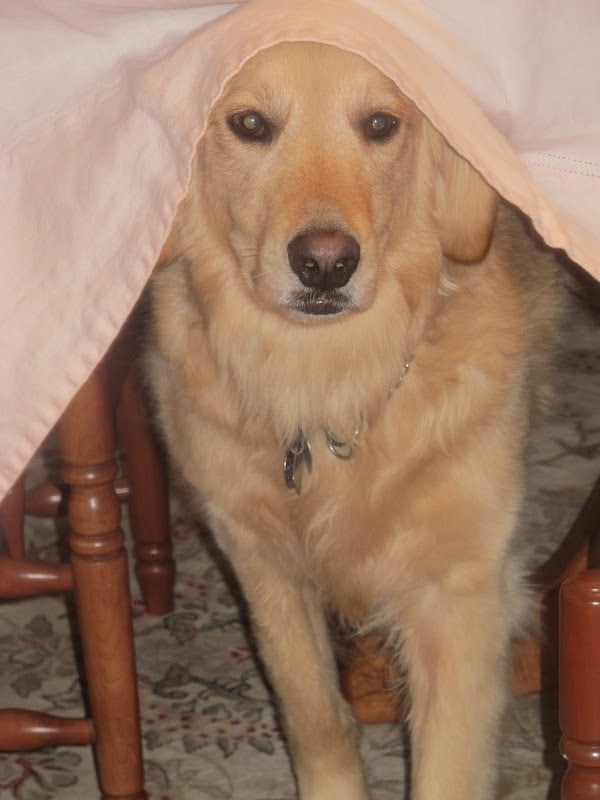 I try and stay off email a lot when I’m away seeing my kids or on vacation, but I couldn’t NOT look at this one. Backyard eggs just hook me right in. 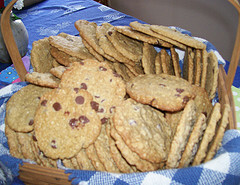 And, of course, cookies fall right out of my oven. 1. I thought I’d share the differences between my granola and David Lebovitz’–his included 3/4 cup brown sugar (I skipped that) and had no fruit at all (I like fruit). I also added ground cloves, which are optional. But I definitely borrowed the idea of applesauce in place of the large amount oil usually used in granola and part of the reason it’s so caloric. 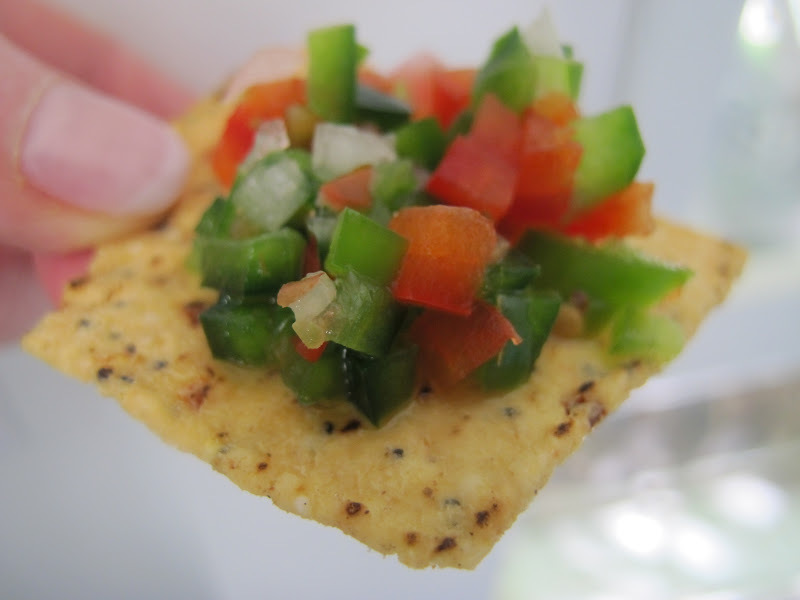 This is very low fat, crispy, tasty, and… well, you’ll like it. 2. Changing it up: The number of additions (and the size of their amounts), to the oats is rather flexible., as are the spices. 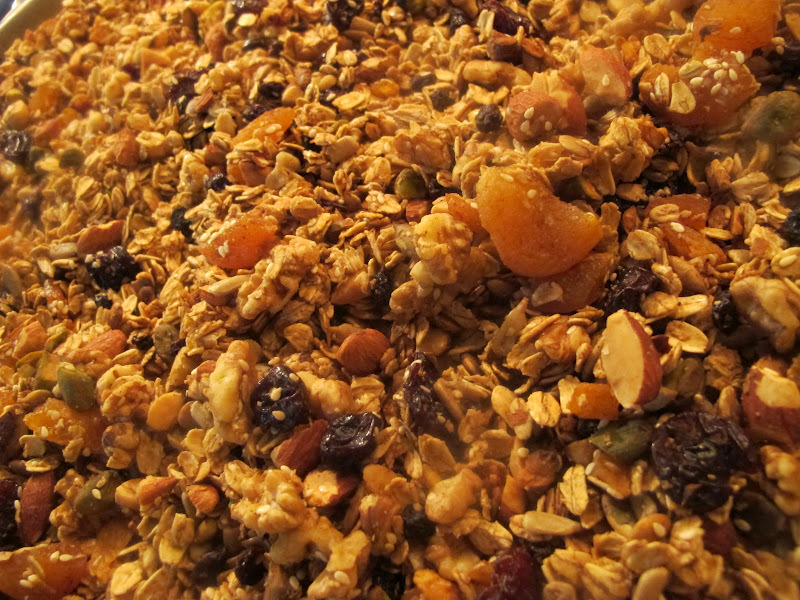 If you only have a few nuts and some raisins, for instance, you can still make this granola. 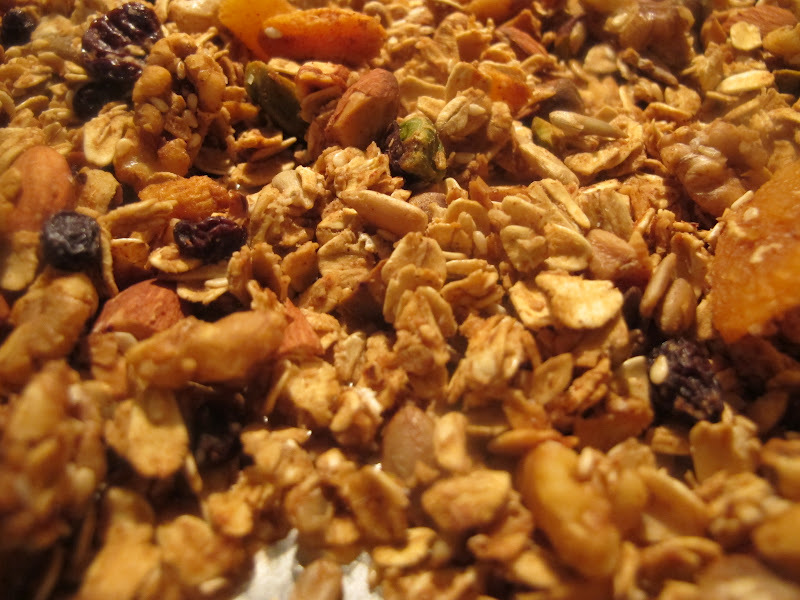 Or if you have only apricots and almonds…you can still make this granola. Only have cinnamon? Use 3 teaspoon cinnamon then. See? Do keep the main ingredients and proportions intact: oats, honey, maple syrup, applesauce, and oil. Wake up and smell the salsa. 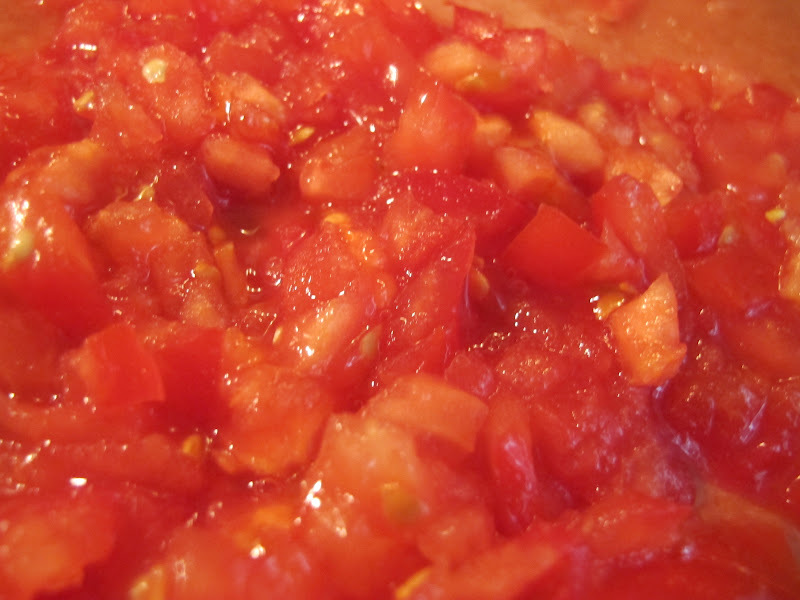 This is not salsa made in New York City. This salsa is made in your house. On your cutting board. And not in your Cuisinart. 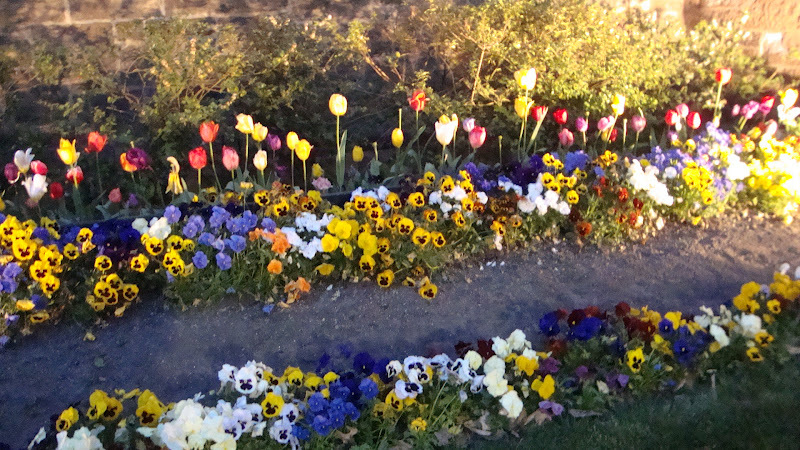 Plant your gardens and sharpen your knives. 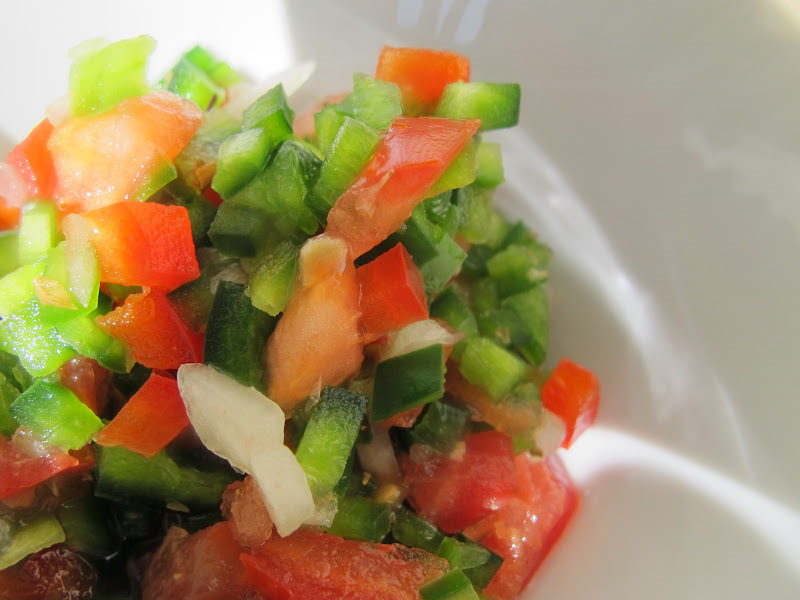 This salsa is worth the time it takes to grow the ingredients and make it by hand. But you can make it in its glorious Mexican-flag colors this weekend in honor of Cinco de Mayo if you’d like! If you’ve not been part of this journey thus far, welcome to my addition to a great group of food bloggers who are, week by week, cooking dishes from the 50 Women Game-Changers in Food from Gourmet Live. 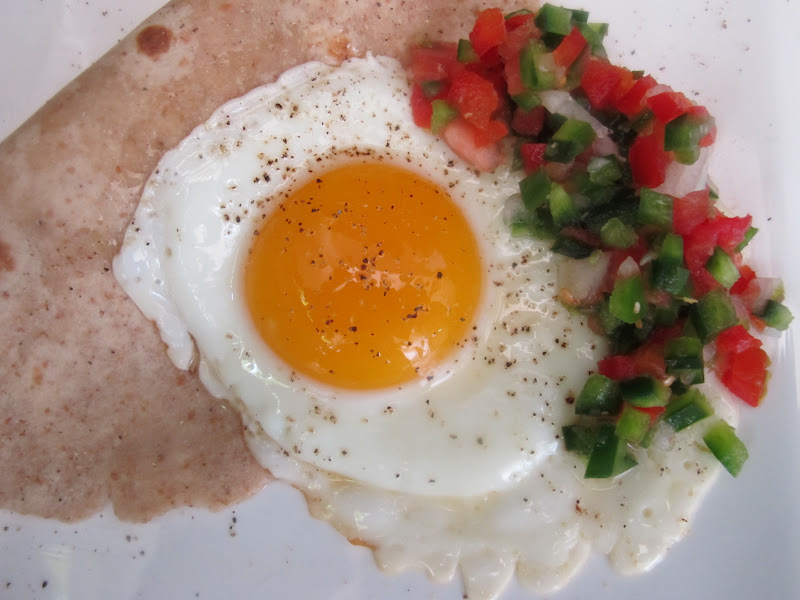 This Friday we feature Mexican chef, teacher, and cookbook author, Diana Kennedy, a Brit (b. 1923) who ended up in Mexico in love with Mexican food for more than fifty years. Intent on sharing her passion, Kennedy wrote many cookbooks, (I count about twenty, though some are in English and some in Spanish.) but has remained most intent on passing on information about the culture of ingredients, agriculture, and cuisine all over the country. Want to check out a recent interview? Read a 2011 interview with 88 year-old Diana Kennedy here. But let’s get to the good stuff. 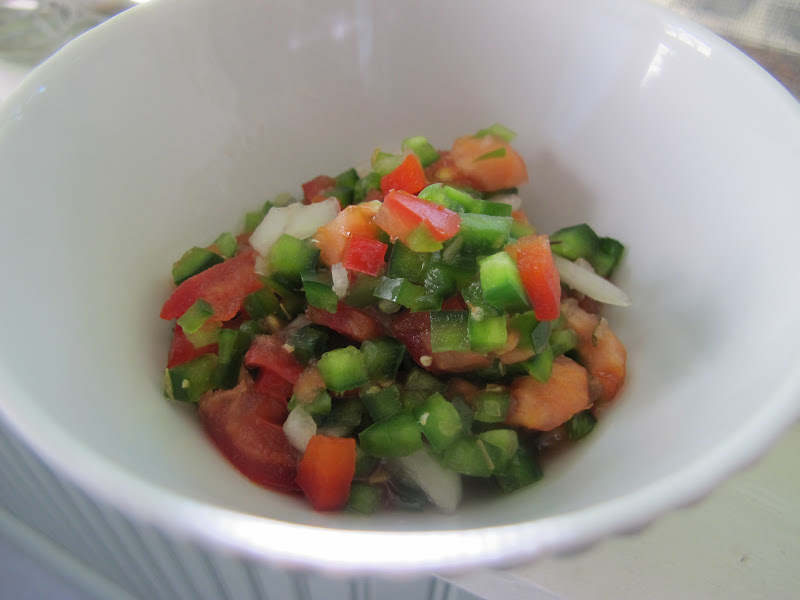 How do you make this salsa? And what’s it good for? 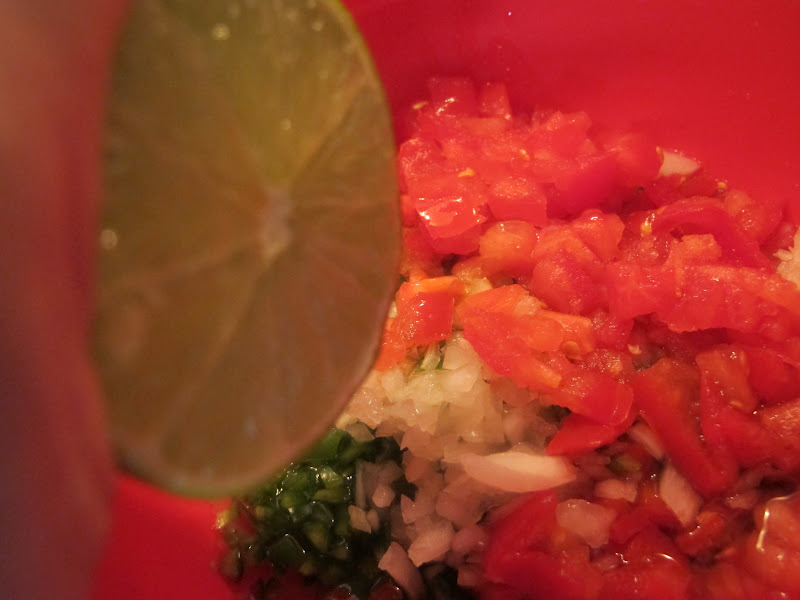 Mix all the ingredients together in a bowl; season with salt to taste. Set aside to macerate for about 1 hour. 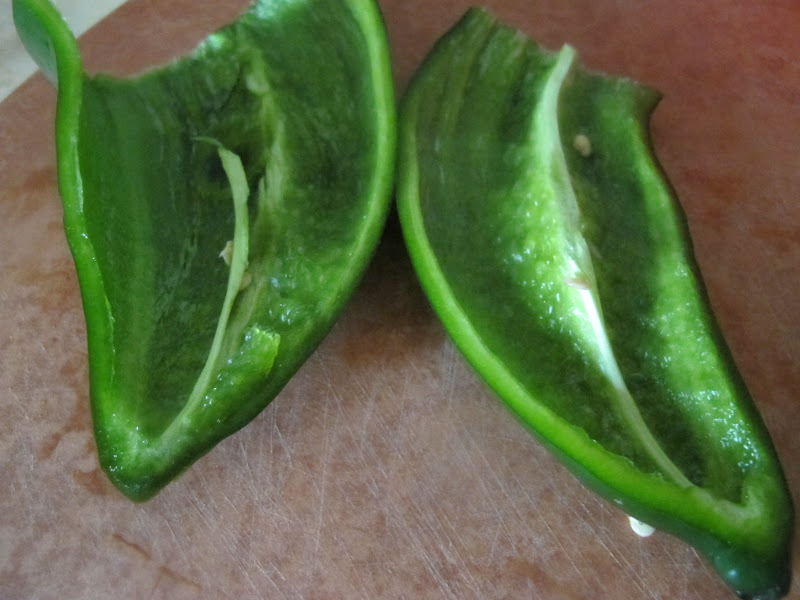 *Not wanting an overly-hot salsa, I substituted red bell pepper for these chiles. My salsa was quite mild. 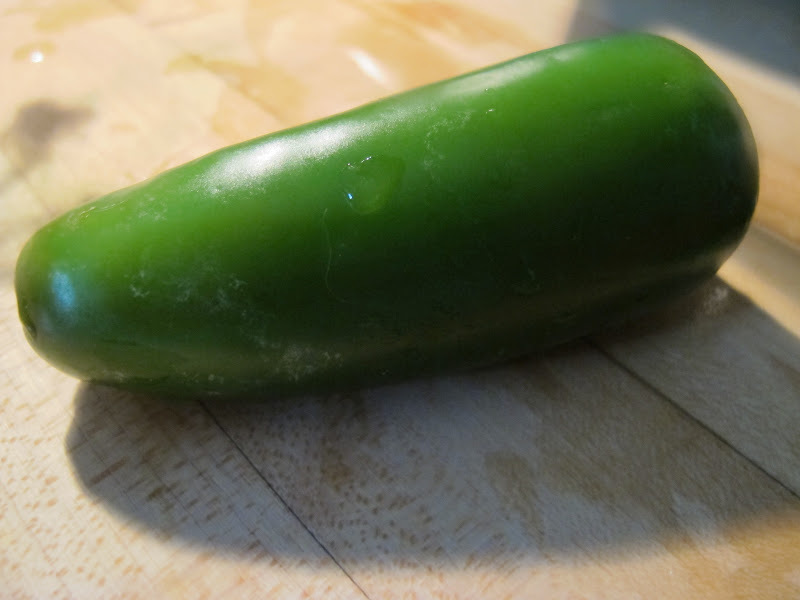 For a hotter salsa, try adding first one and then another yellow chile. Recipe courtesy FOOD & WINE. 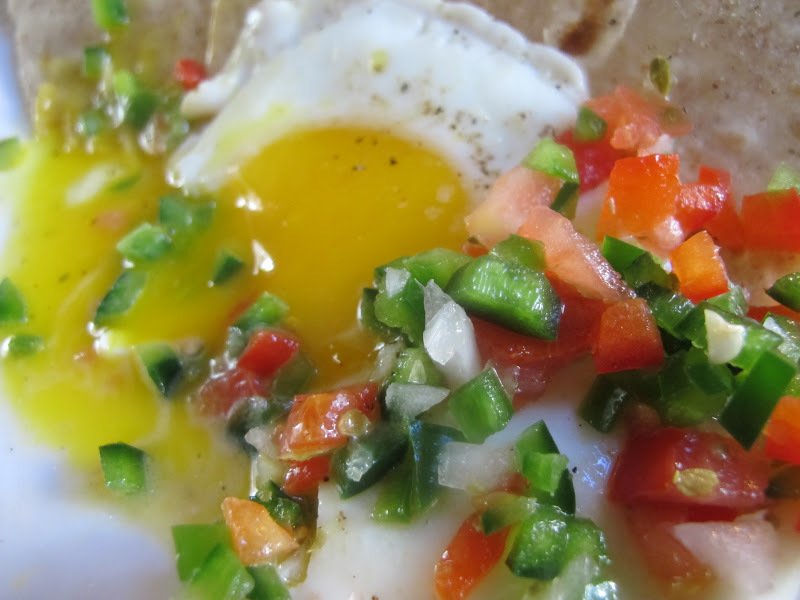 This salsa was really tasty with eggs, and while I’m not a chip-eater, I did try it with some tortilla chips and would have eaten more if I weren’t saving some for a Friday night movie. I think it would make a great veggie dip; I’m always looking for vegetable-based dips. You could ladle this sauce over simple greens or plain steamed vegetables. I thought I’d try it with some plain grilled chicken and then in a chicken taco salad over the weekend. My guess is it won’t keep more than a couple of days, but who would want it to? 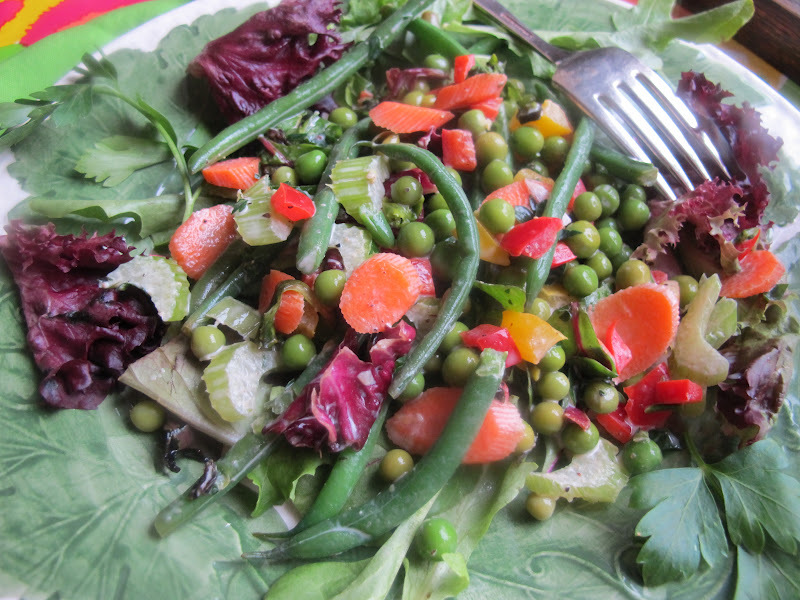 I just loved the colors and intrinsic beauty of the ingredients and kept taking photographs of the greens and the reds…. Eggs traded for cookies with a St. Paul pianist who has a backyard full of chickens. 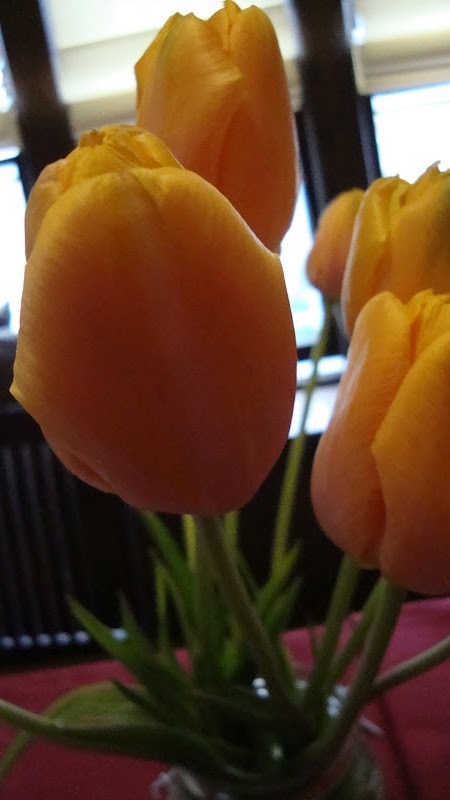 Cooking for One – It’s Fun! Next day: add some feta, more vegetables, and some oregano for a great salad. While the orzo cooks, saute the asparagus, fennel, peas and onion in the olive and butter for 3-4 minutes until softened. In a large bowl, mix together the drained orzo with the cooked vegetables. Add the lemon juice, lemon rind, and season generously with kosher salt and freshly ground pepper. Add a bit of crushed red pepper (or aleppo pepper if you want the taste, but not all the heat) and taste. Adjust seasonings. Serve hot or at room temperature. For the next-day or summer cold salad, you can add to the leftovers chopped feta, dried oregano, fresh basil, any other on-hand chopped vegetables, a splash of red wine vinegar and a little more olive oil. 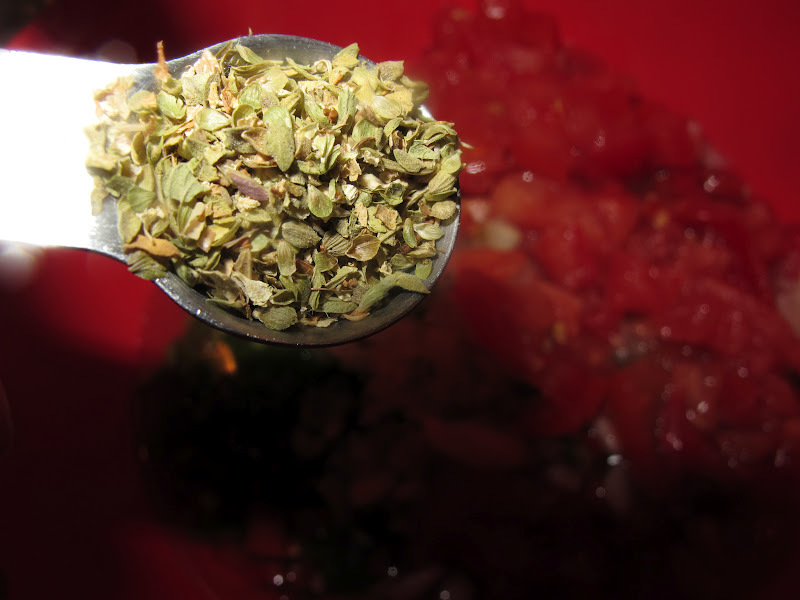 Taste and adjust seasonings again. 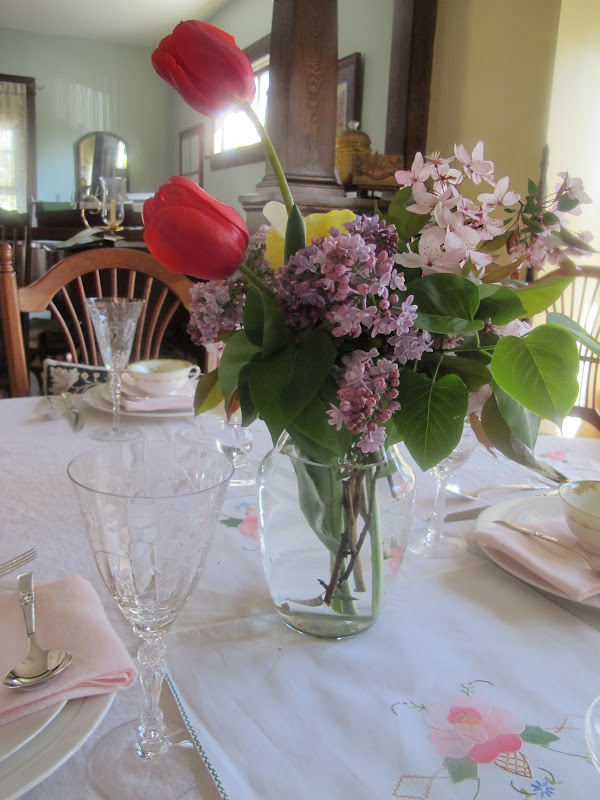 All together: Annual Lilac-Bloom Dinner last Friday at our house. Newman came for the occasion. 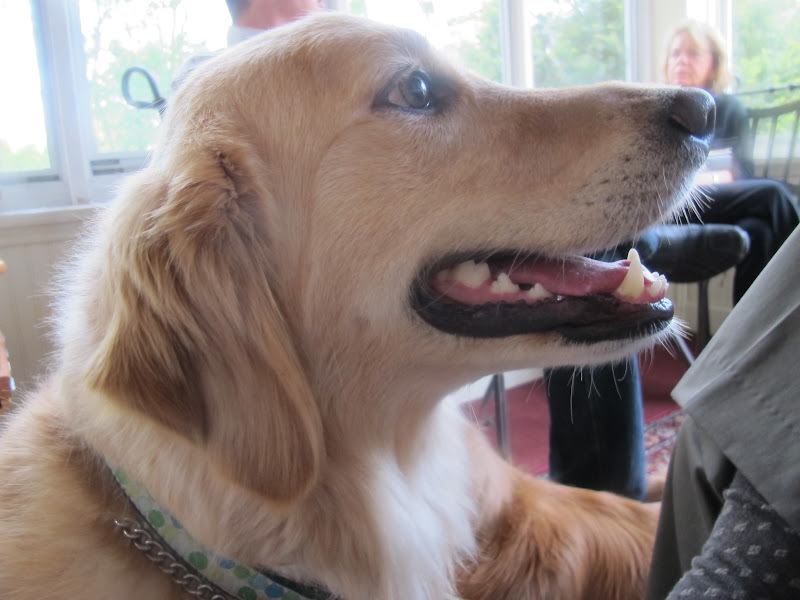 Gabby’s always happy with guests! 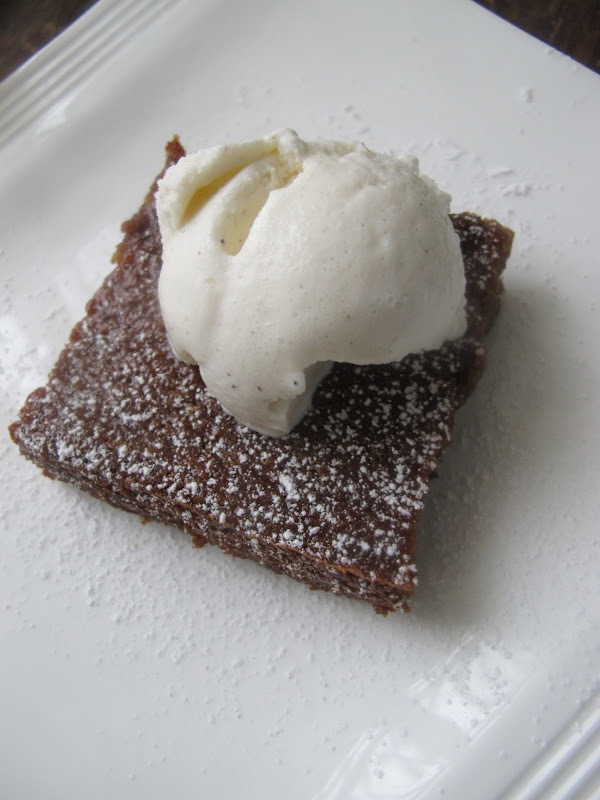 A tender, quite moist gingerbread from Nigella. *I have just installed a combination microwave/convection oven above my range. This may help with summer baking. More later! If you haven’t had the pleasure of watching Nigella on tv or reading one of her books, you just need to do it. 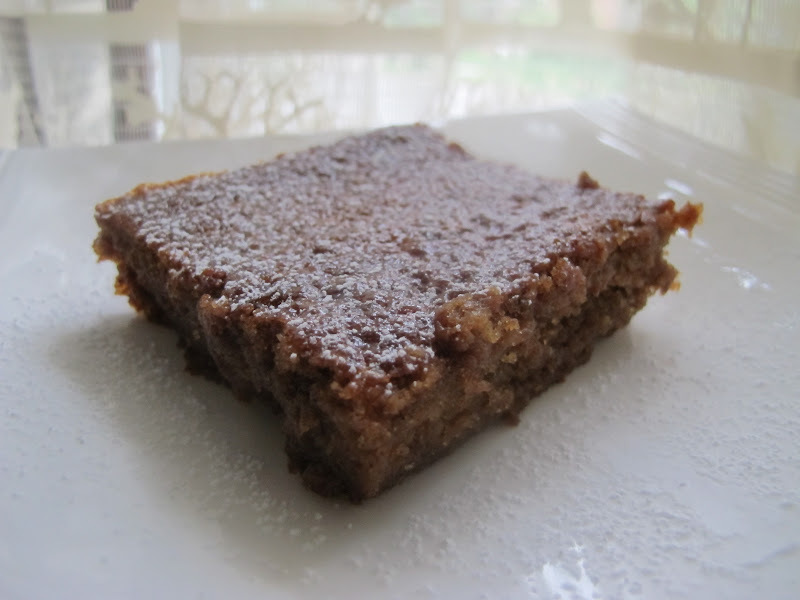 Picture a well-fed, very pretty British woman with a great accent sneaking out of bed in the dark to raid the refrigerator of crispy fried pork fat or snarfing down the last, well-hid piece of flourless chocolate cake. Not only is she real with a capital R, but she’s fun and brings more than a bit of the seductive into the kitchen, where it surely belongs. Whatever…it’s great to watch someone enjoy what they do and Nigella does that in spades. Isn’t that what really draws us to people? I adore friends who are happy in what they do. For a biographical sketch that may surprise you, check out Nigella’s Food Network biography page here. Not only has Nigella been a food tv star for several years and written a variety of best-selling cookbooks, but she was Deputy Literary Critic of the (London) Sunday Times before setting out to follow her own drummer as a free-lancer. No small apples. 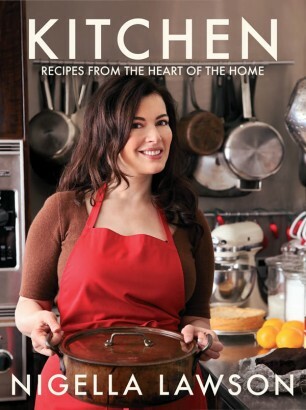 For a list of all of Nigella’s books, lots more info and recipes, check out her website. But! 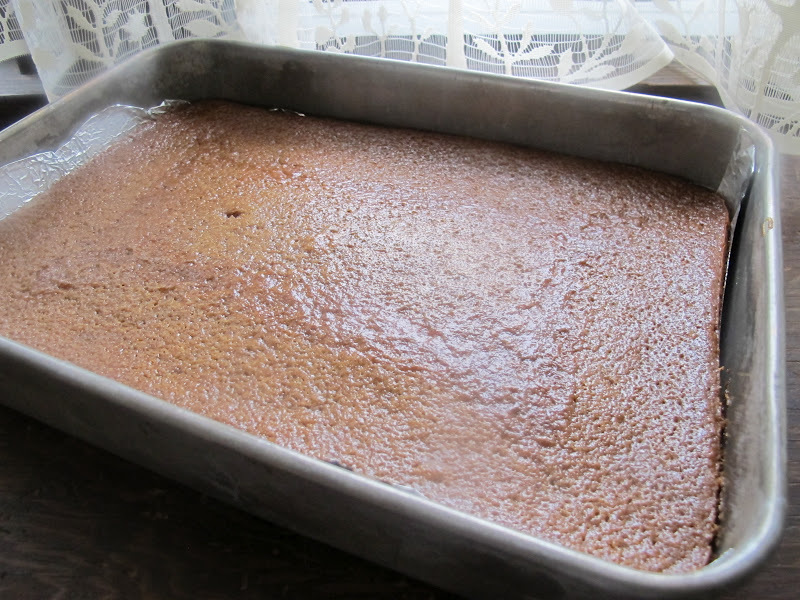 If you’re intrigued by the gingerbread: get out a 9×13 pan and get baking. Easy as pie (which isn’t easy–who said that?) 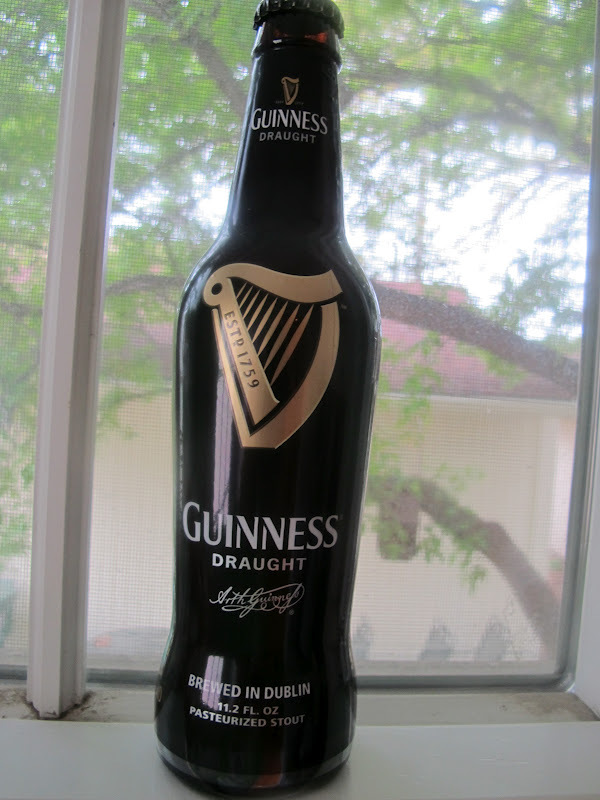 you warm up some butter, a cup of Guinness stout and a couple of other things, whisk in a few dry ingredients, pour into a greased pan and bake for 45 minutes. 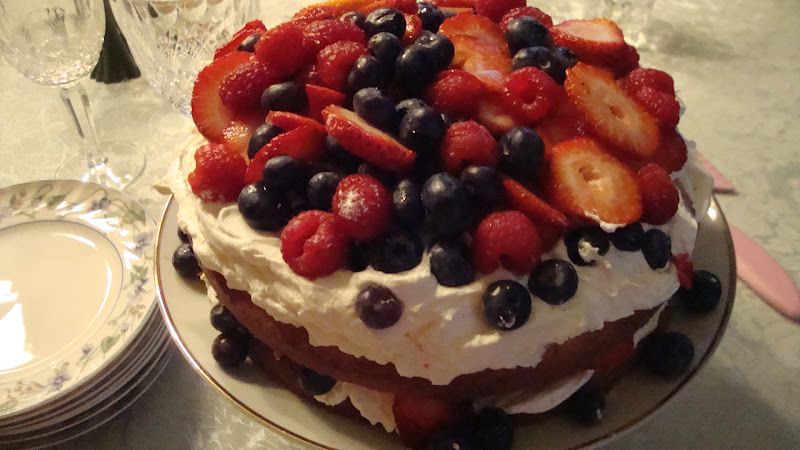 Cool, cut, and serve with whipped cream, ice cream, or Crème fraîche. Nothing better. My own notes are in red. Enjoy! Preheat your oven to 325 degrees F. Line your cake pan with aluminium foil and grease it, or grease your foil tray. 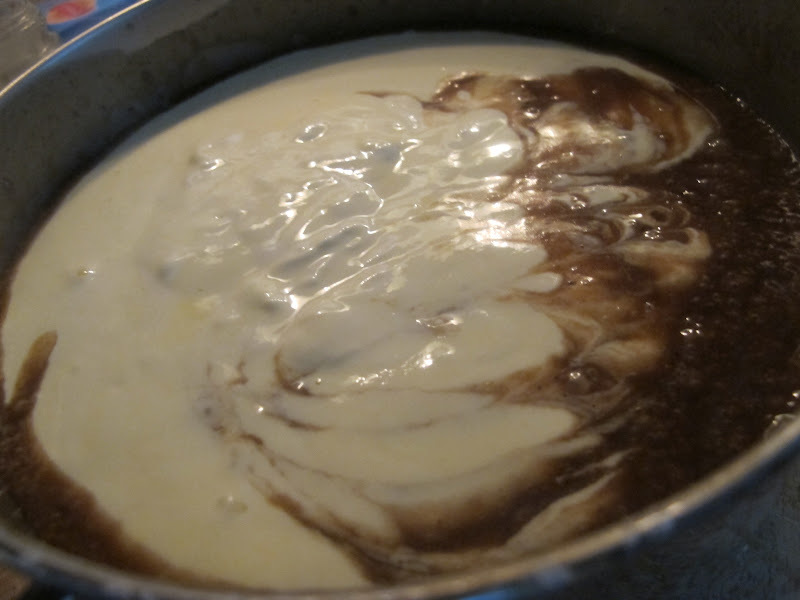 Put the butter, syrup, dark brown sugar, stout, ginger, cinnamon and ground cloves into a pan (2-3qt saucepan) and melt gently over a low heat. 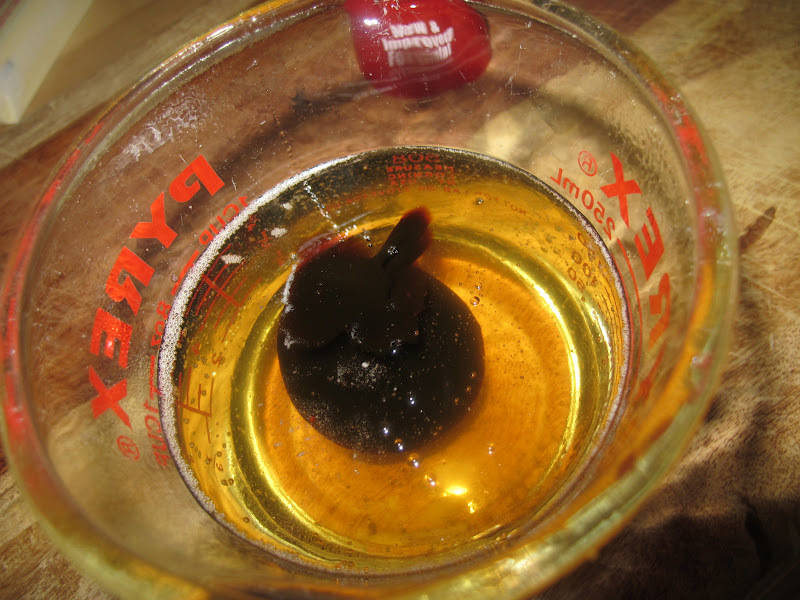 Organic Corn Syrup with a little molasses poured in…quite pretty. Dave was so sad that I bought a whole 6-pack. 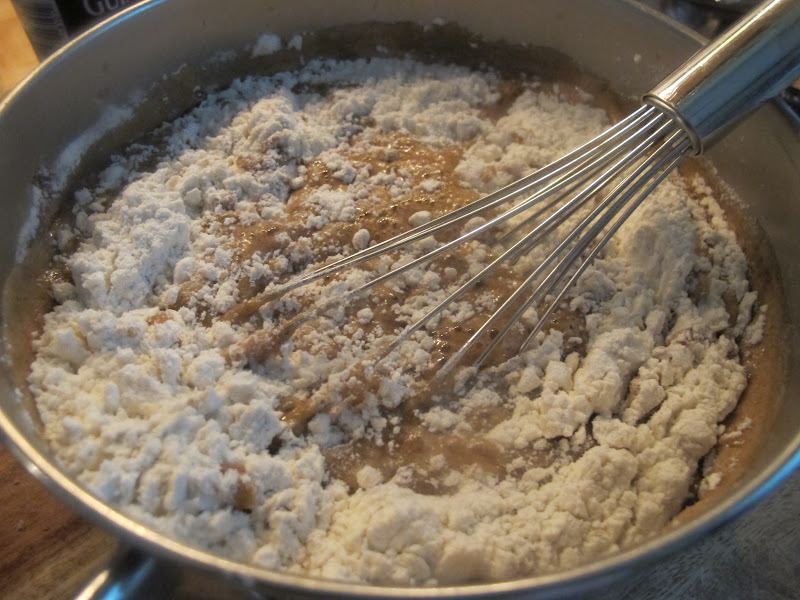 Take off the heat and whisk in the flour and baking soda. You will need to be patient and whisk thoroughly to get rid of any lumps. Whisk the sour cream and eggs together in a measuring jug (4c glass measuring cup) and then beat into the gingerbread mixture, whisking again to get a smooth batter. Pour this into your cake/foil pan, and bake for about 45 minutes; when it’s ready it will be gleamingly risen at the centre, and coming away from the pan at the sides. Let the gingerbread cool before cutting into slices or squares. 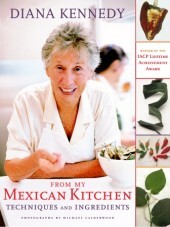 Next week we’ll feature Diana Kennedy, the very fine Mexican cookbook author. Join us! Just a note: I’m away from home, on a borrowed computer and using an old suitcase camera. ﻿If I could have chosen which of Gourmet Live’s 50 Women Game-Changers in Food I’d be, at first glance I’m sure I would have chosen Elizabeth David or M.F.K. Fisher — two of my favorite all-time food writers. But, no, I adore Ina Garten and I surely might have picked her. Of course, there’s the omnipresent Julia. Who wouldn’t have wanted to be that particular ice-breaker? But as we’ve gone through the list, I’m impressed over and over again with the sweet love for life all these women have. I adore them all in some way. The oh-so-interesting ideas they entertain. The passion for the exactly right thing to eat at exactly the right time. The attention to detail. The waiting for the perfect pairing. Not wasting a thing. Wanting to end hunger. The years spent with a head cocked sideways off a body leaning floorward to check a pan of cookies. 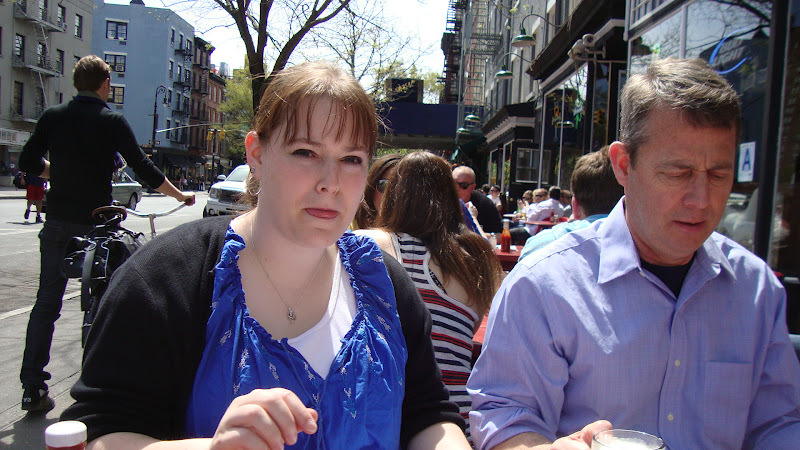 The eyes squinting from too many small-print cookbooks. Because those of us in love with food are unusual people. 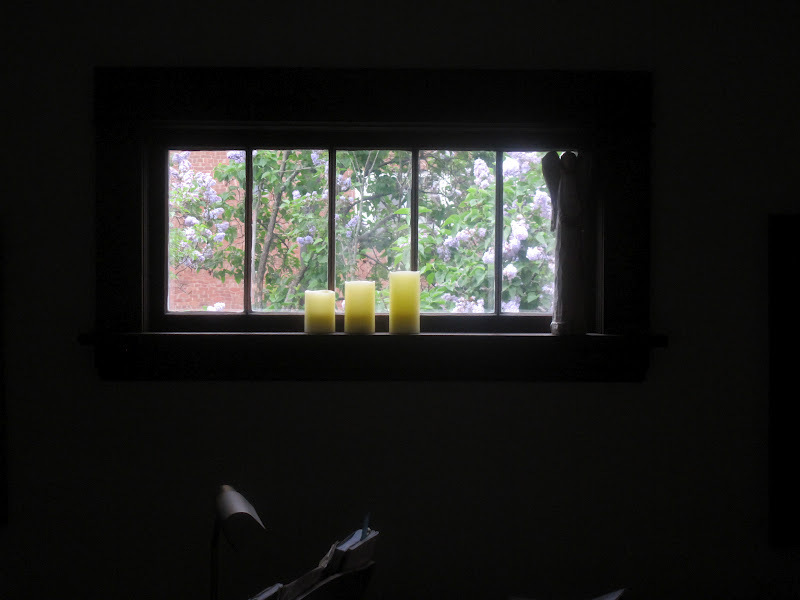 We are quite surely not “the girl next door,” despite our lust for making dinner. We are maybe one little cut off the totem pole from the average female bear. To begin with, we mostly don’t care if we don’t earn any big bucks, though we surely wish we had more than we do. We’re more interested in having our arms firmly around the perfectly-browned loaf or our tongues guaging a finely seasoned vinaigrette. We care more about who’s at the table and how we show our love by making their favorite roast chicken at dinner time. Or showing up at the picnic with someone’s best-loved rhubarb pie. We’re a bit addicted, though, and probably do want to win the prize at the fair… or at the competition. Somewhat obsessed. Overly focused. 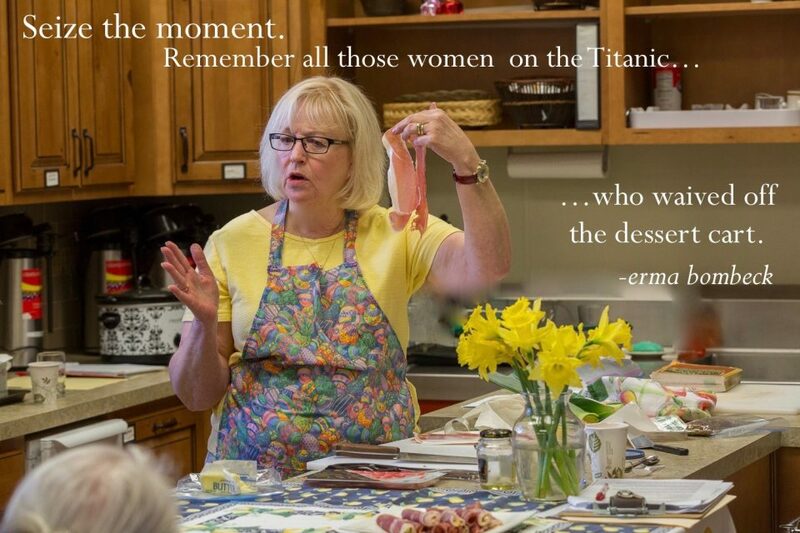 We are, to coin a phrase, highly seasoned women. As my mother-in-law might say, “WHAT are you making NOW?? ?” As if I were crazed. Which I might be. Which is something all of us food-lovers have in common. And so comes April Bloomfield — one of these marvelous she-cooks, whose name didn’t ring a bell, but whose restaurant my family visited a few months back. 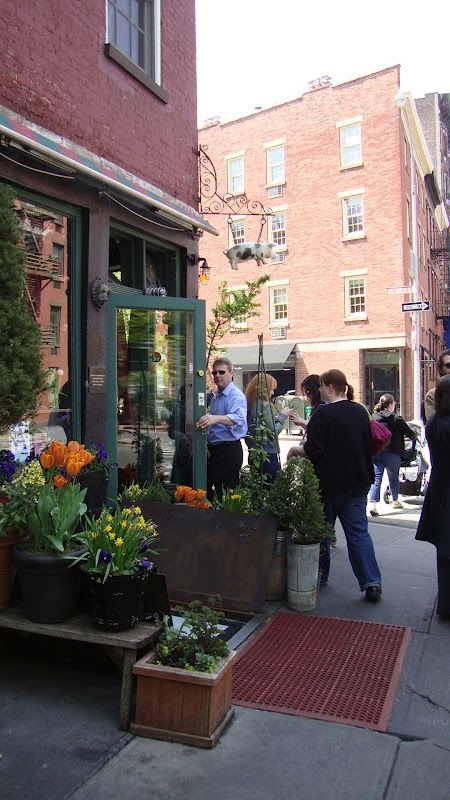 (It just happens I’ll eat at The Spotted Pig, April’s New York eatery, myself this Saturday– or hope to before or after attending a Broadway show with same fam. I may re-do the blog once I have a few more personal pics. See above) And it also just happens that as I write, the young and famous Ms. Bloomfield has just published her first book, A Girl and her Pig. But really–the more I read about her, the more fascinated I became with her up-front no-frills, Birmingham, England language (keeping up with any line cook I’ve ever worked with or met) and cooking–The more I understood how she earned her place on the list. Because she fits the bill. She’s got the obvious dedication, the love of extremes, the fascination with the product, the craze for the itsiest part of the process. 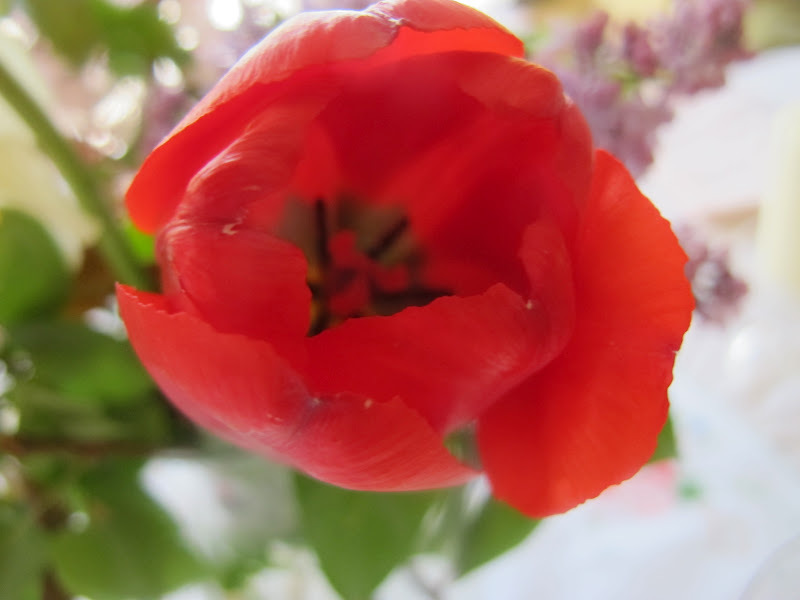 The willingness to put everything else aside. Well, mostly, anyway. 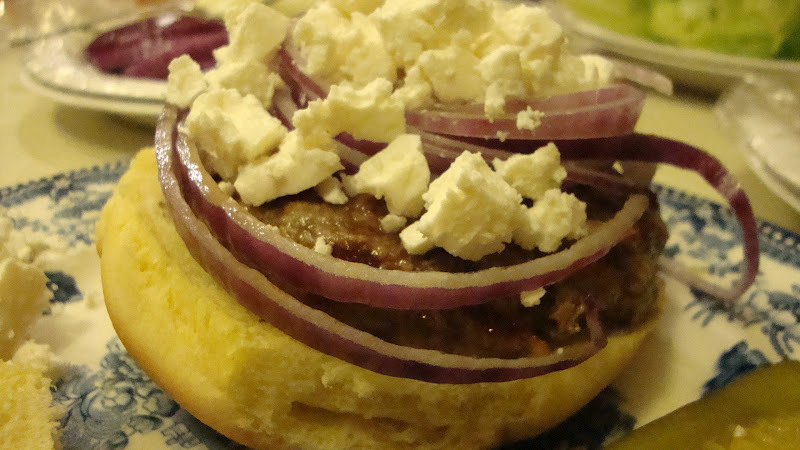 Without much more ado, I think it best to share an April Bloomfield recipe–one which, from the background reading I’ve done, might come from the restaurant Breslin as it’s a lamb burger topped with feta.. Try this simple ha! 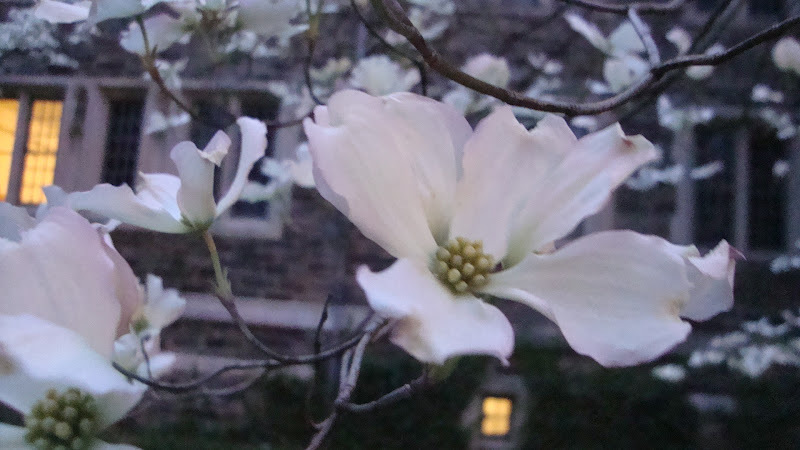 meal yourself and see if April doesn’t win your heart. I–actually the love of my life– made a few last night for a bunch of burger-loving neighbors and there were simply only raves. The obvious clue is this: it’s all about the meat. All about the meat being exactly what it should be. The best it can be. No mucking it around in some fancy-schmancy tartar sauce-like slop to mar or obscure the taste of what it is, which is meat. Just the facts, ma’am. No condiments. No mustard. No mayo. Just the stuff on the recipe. Trust April. Combine ground lamb shoulder in a bowl. Mix thoroughly for three minutes using your hands. Divide into four balls. 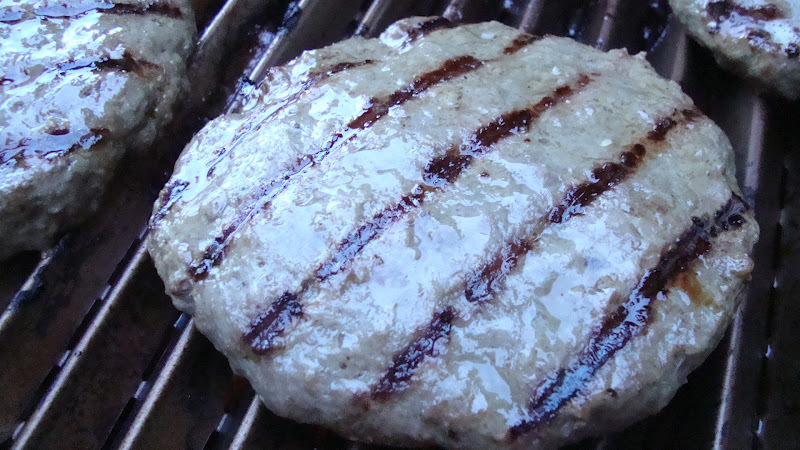 Form into patties and allow to rest in the fridge for a minimum of two hours. Meanwhile heat pan or grill to medium heat. 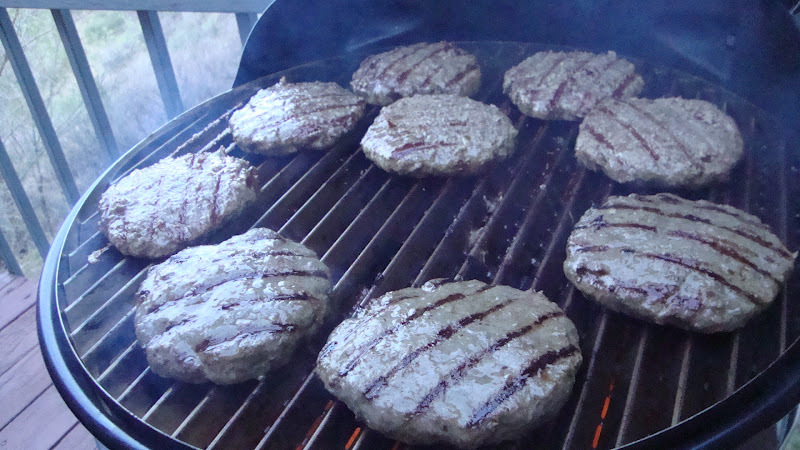 Season lamb burgers with salt and place gently on cooking surface. Cook for five minutes on each side and allow to rest for two minutes. Feel free to toast the buns. Top off with sliced feta and red onions. See? No mustard. Not even much in the way of onions. Lots of meat and lots of great bun. Maybe toasted. Wine? Oh, honey. Do yourself a favor and grab a nice, big juicy Syrah. California Syrah or Australian Shiraz. Sides? 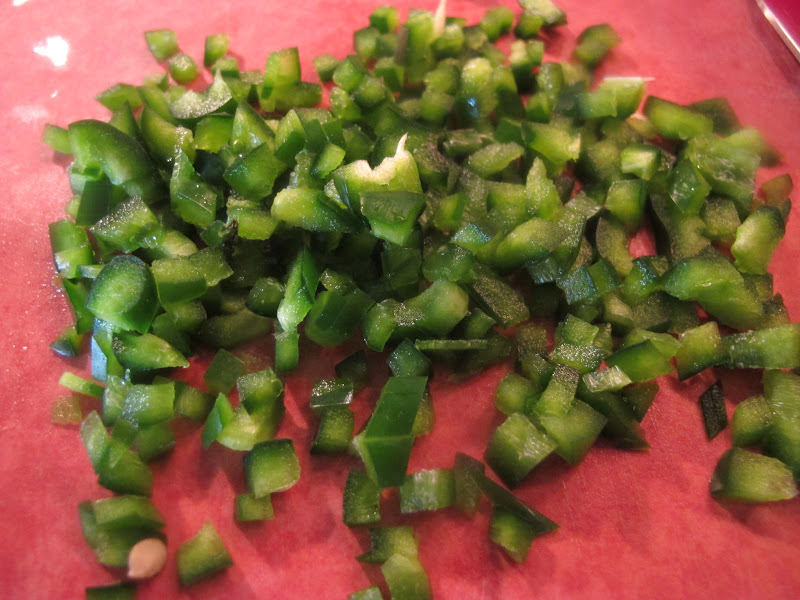 I like a bit of a fresh homemade pickle with this…some cucumbers sliced thinly and mixed up with a good dose of white vinegar, a bit of salt, sugar, pepper and a good pinch of crushed red pepper. 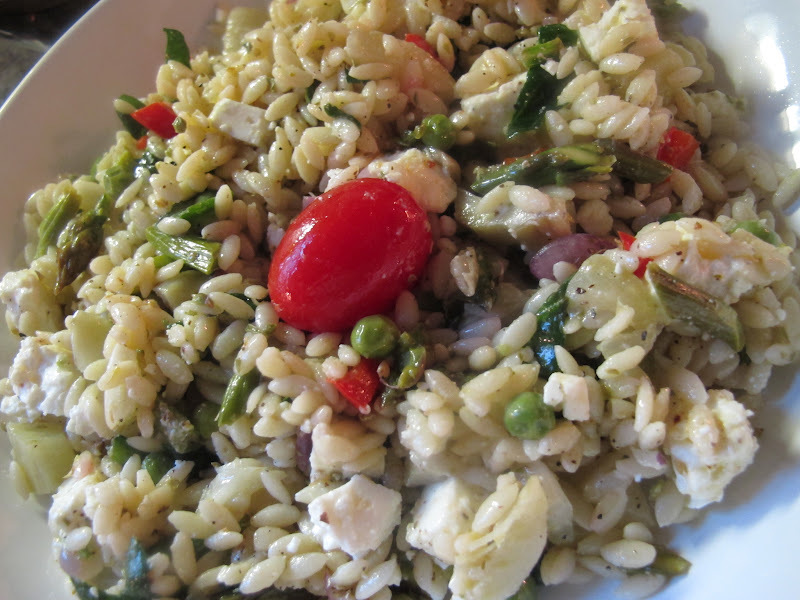 If you’re hungrier, or have a crowd, make a hearty orzo salad with lots of blanched fresh vegetables, parsley, basil, and maybe some more feta. 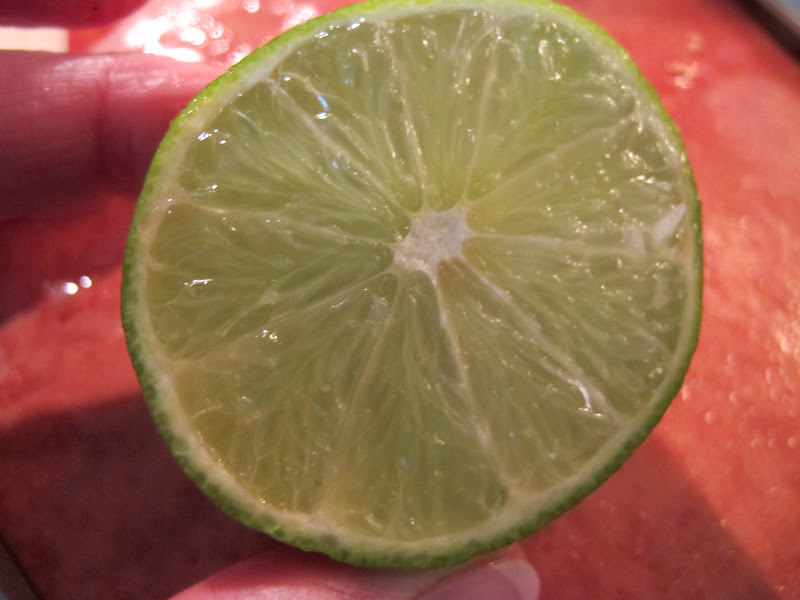 Lemon juice and olive oil for a dressing. OR If it’s summer, just slice up a big platter of great tomatoes and be done with it. 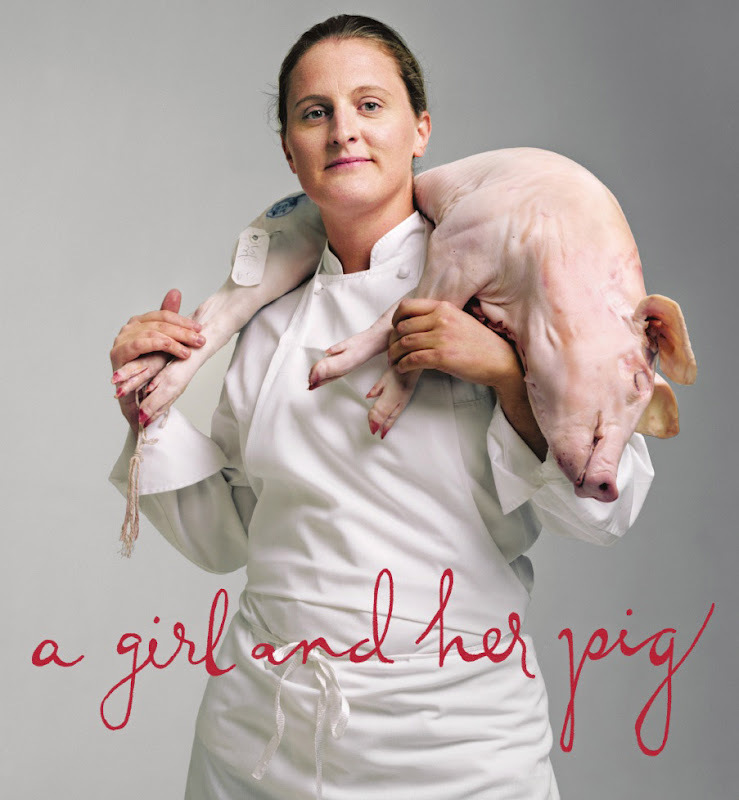 April Bloomfield is the executive chef and co-owner of The Spotted Pig, Breslin, and The John Dory Oyster Bar in NYC. A native of England, Bloomfield began her career at London’s Kensington Place, then moved on to the city’s Bibendum and River Cafe (where Jamie Oliver got his start), before landing a spot at Alice Waters’s Chez Panisse in Berkeley, California. 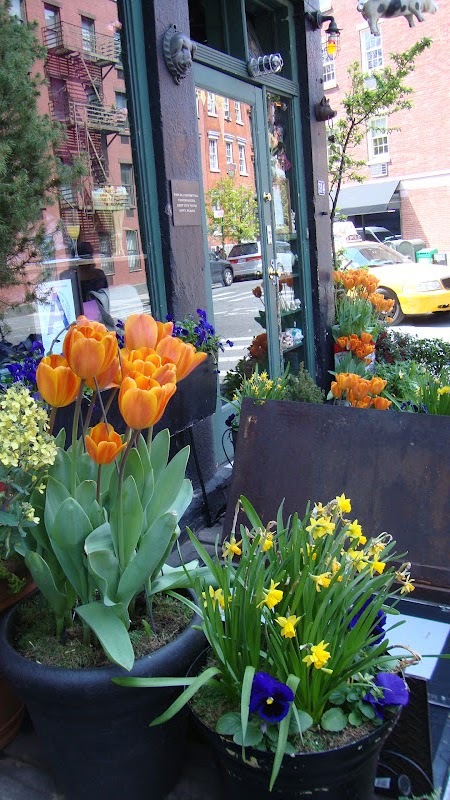 She opened The Spotted Pig with Ken Friedman in 2004. courtesy Food & Wine. 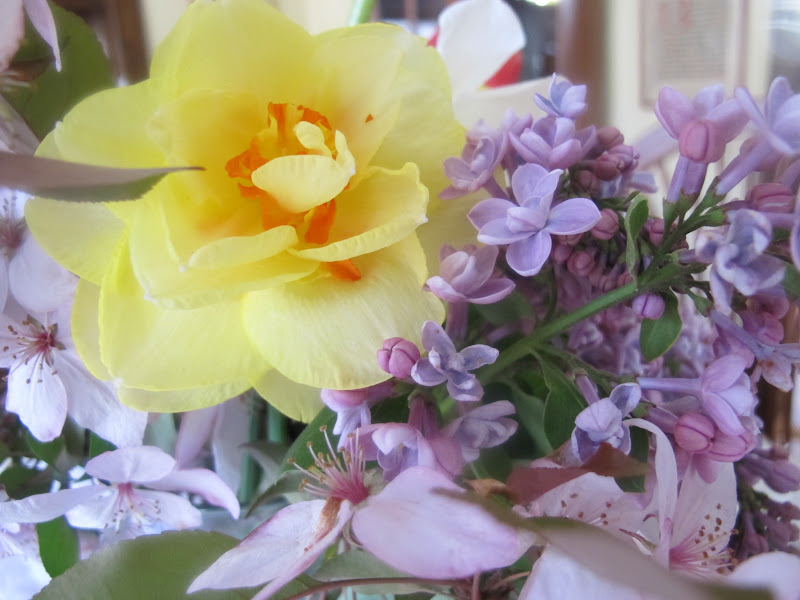 Heather – girlichef, Miranda – Mangoes and Chutney, Amrita -: http://beetleskitchen.com. Cupcakes–Make them and freeze them tonight. Defrost and frost Saturday or Order plain from the bakery and decorate at home. and then grill a few tiny, but fat double lamb chops while quick-roasting a pan full of long, slim carrots covered with pepper and rosemary. Phew. 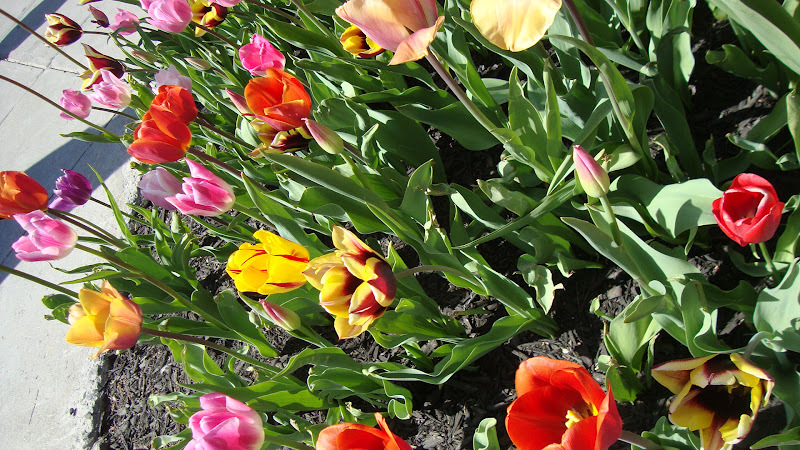 Just a few tulips–the perfect centerpiece. 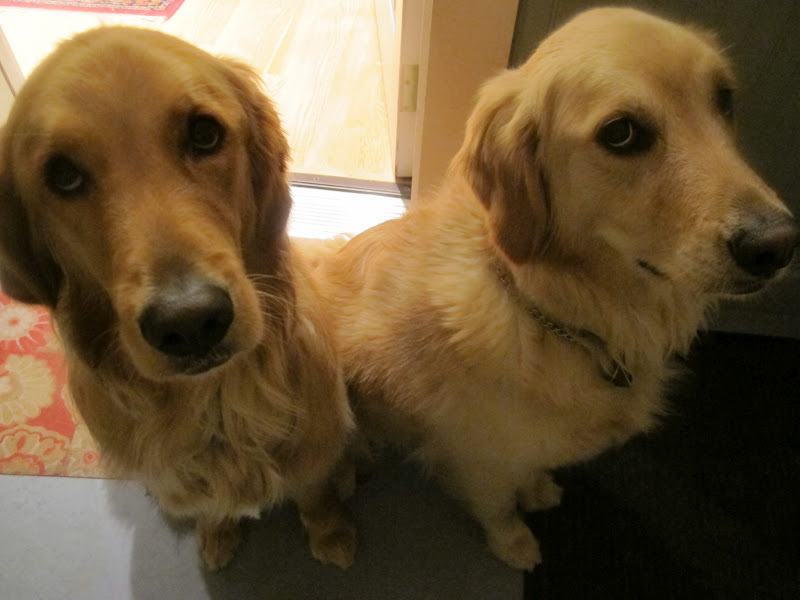 No cupcakes for these guys. 1. Today or Tomorrow: Do grocery shopping. 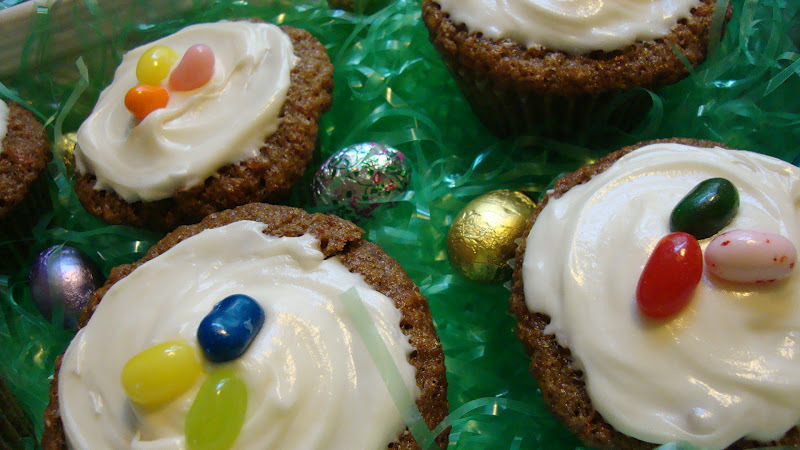 Make/buy carrot cake cupcakes. Freeze plain cupcakes. 2. Friday: Make tapenade and store well-covered. Keep others out of it until Sunday. Boil eggs. 3. Saturday: Used boiled Easter eggs and make deviled eggs. Store loosely covered in refrigerator. Do not sprinkle with paprika until ready to serve. Here are three recipes or make your own. 4. Saturday or Sunday morning: Make the salad and dressing. (recipes below); refrigerate them separately until Sunday. In the morning: unthaw and frost cupcakes if not already done. Store out of reach of the dogs and kids. 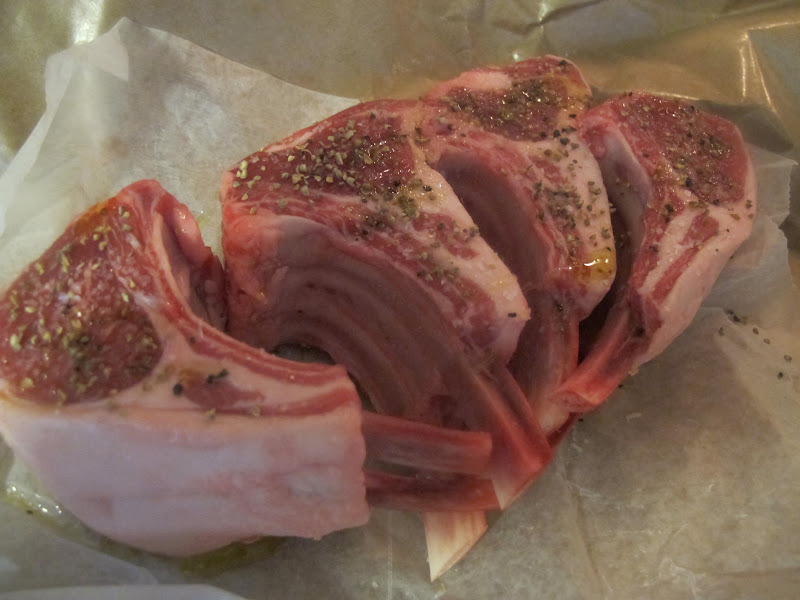 1 1/2 hours before dinner: Bring lamb chops to room temperature. Uncork/decant red wine. Set out deviled eggs and uncork white wine for starters. 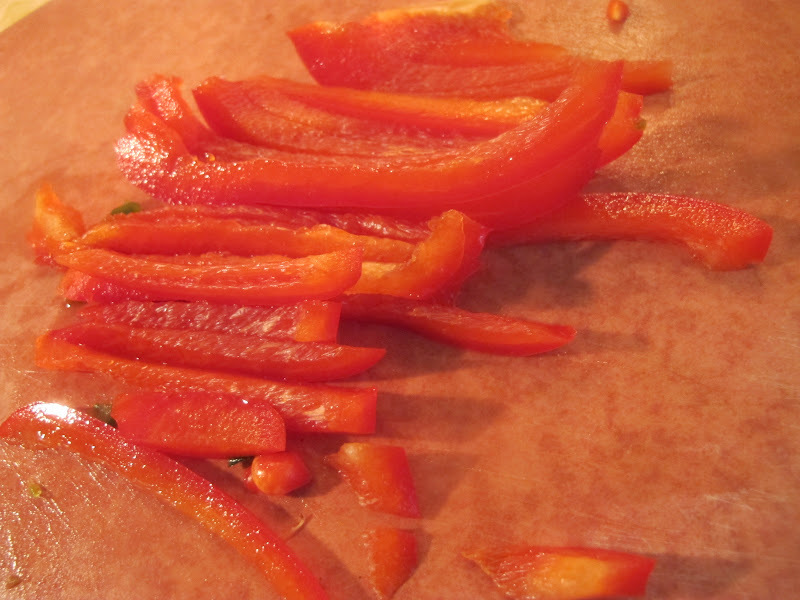 Peel/prepare carrots and place on a half-sheet pan. Prepare chops for cooking. Pan-grill, then roast chops and oven-roast carrots. Place chops and carrots on a large platter with tapenade and pass at the table. 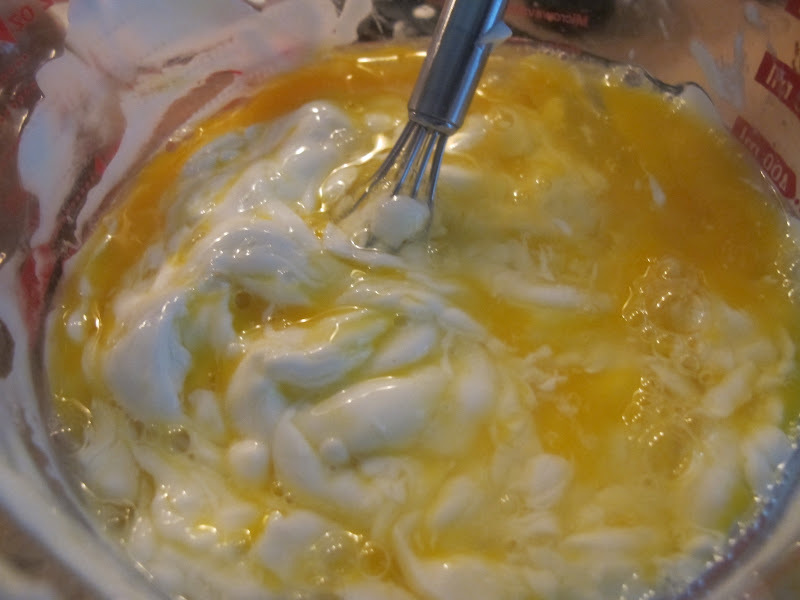 Just before eating: Spoon salad into large serving bowl, drizzle with dressing, and toss well. Pour red wine. Place bread on table if serving. This recipe calls for you to blanch the beans and fresh peas briefly in boiling water, drain, and cool quickly in an ice bath. You can also cook them, separately, in the microwave for 2-3 minutes with just a couple of tablespoons of water in a microwave-safe covered bowl. 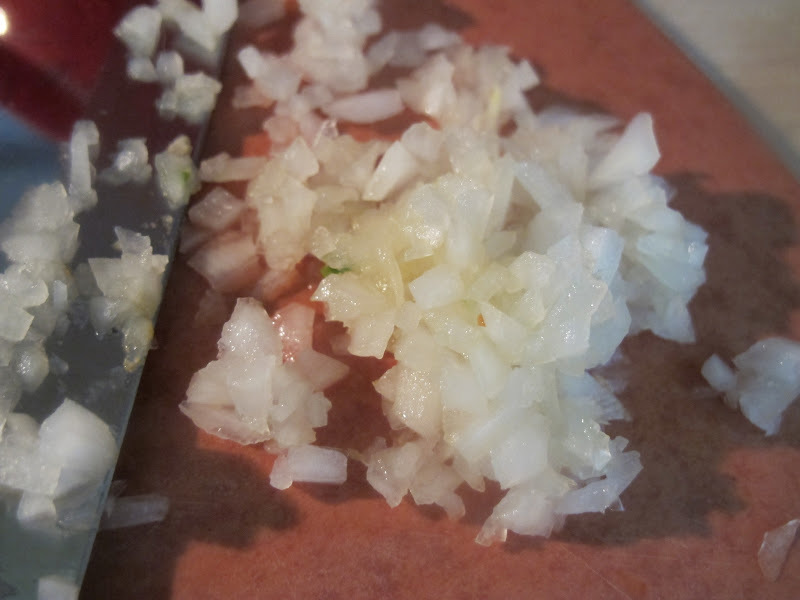 Dressing: 2T minced shallots, 2T lemon juice, 1 cup half and half, 2T finely minced flat-leaf parsley, 1/4 tsp each sea salt/ fresh ground pepper, 1 tsp grated lemon zest, 2 drops Tabasco. Place all ingredients in a jar with a tightly-fitted lid and shake vigorously when making and just before dressing salad. One day ahead: Mix all salad ingredients—except lemon juice– together in a large bowl. 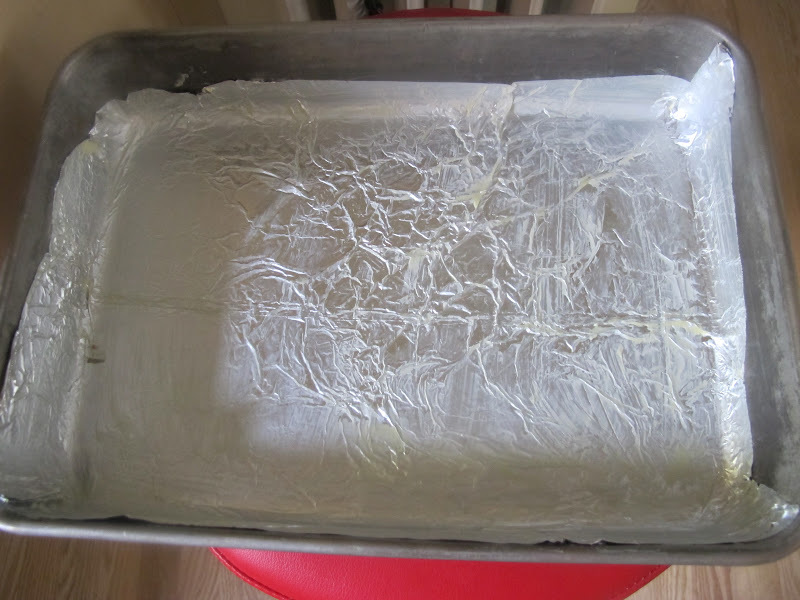 Cover tightly with plastic wrap and refrigerate. Note: This salad is loosely based on one from the book SALAD FOR DINNER by Patricia Wells, who is one of my favorite cookbook authors. 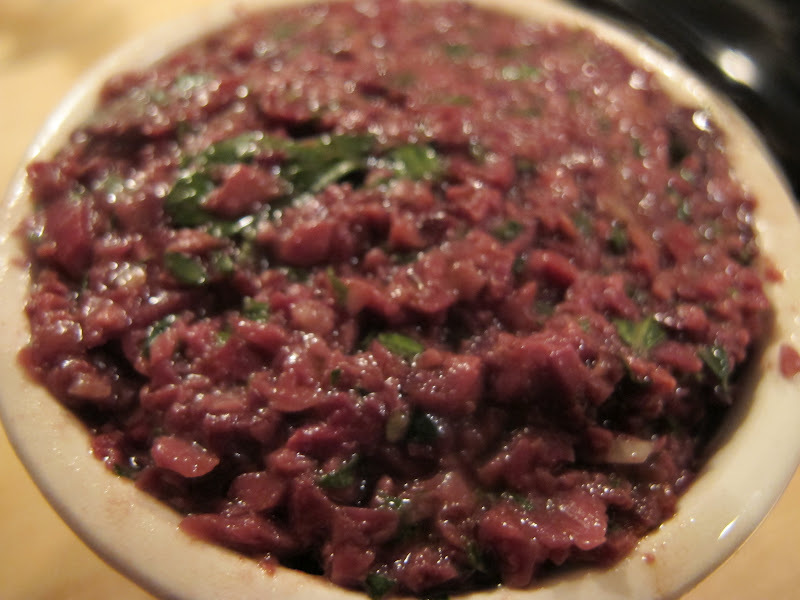 Tapenade- Chopped olives, garlic, parsley and anchovies. Great with sliced baguette or crackers, too. Process all ingredients in a food processor fitted with the metal blade. Taste and adjust seasonings. Store, well-covered, in refrigerator until needed. Serve in a bowl on the table for guests to help themselves or spoon a bit on each chop if you like. B. 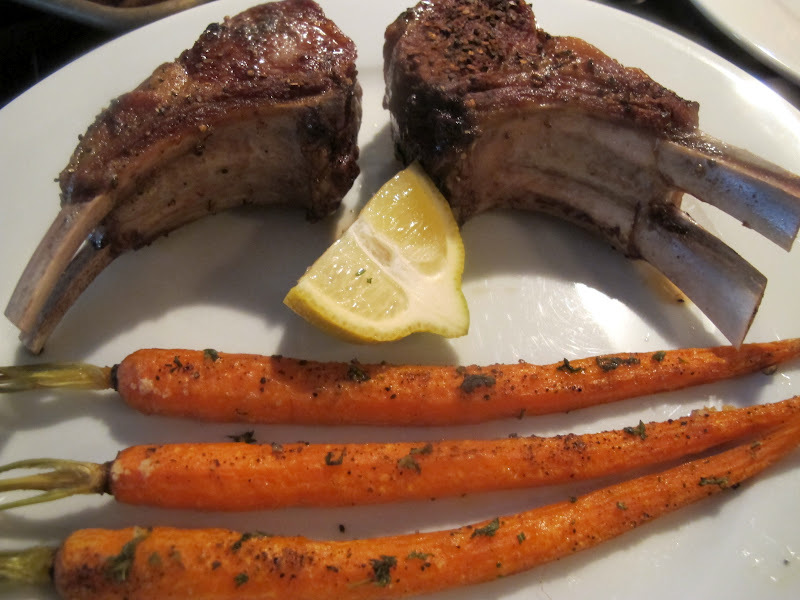 For chops and carrots ( recipe, see below) — about 45 minutes before dinner time. 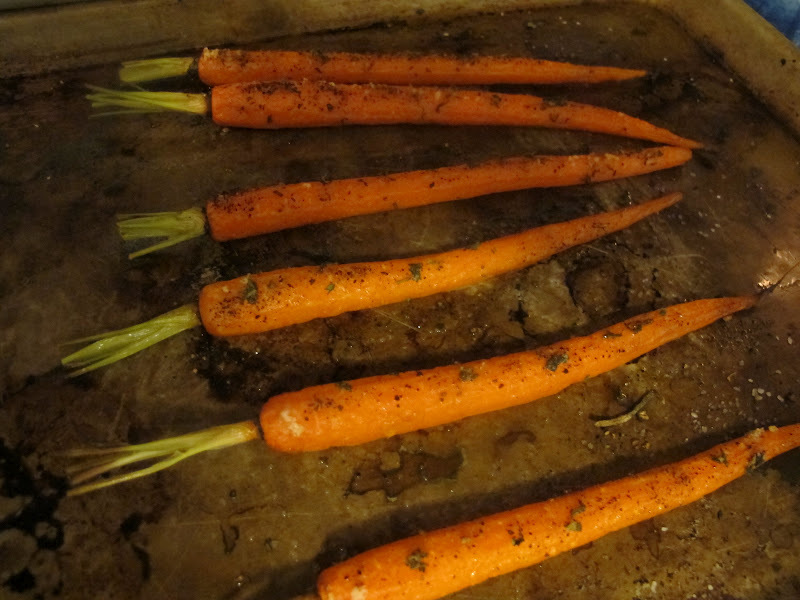 Place carrots on a large baking sheet/s, drizzle with oil and dust generously with salt, pepper, and rosemary. Place pan of carrots in the oven on a rack in the bottom third of the oven and roast until tender and somewhat crispy. Heat grill pan or large, heavy skillet/s for the chops over medium-high heat. Place another rack, for the chops, in the upper third. 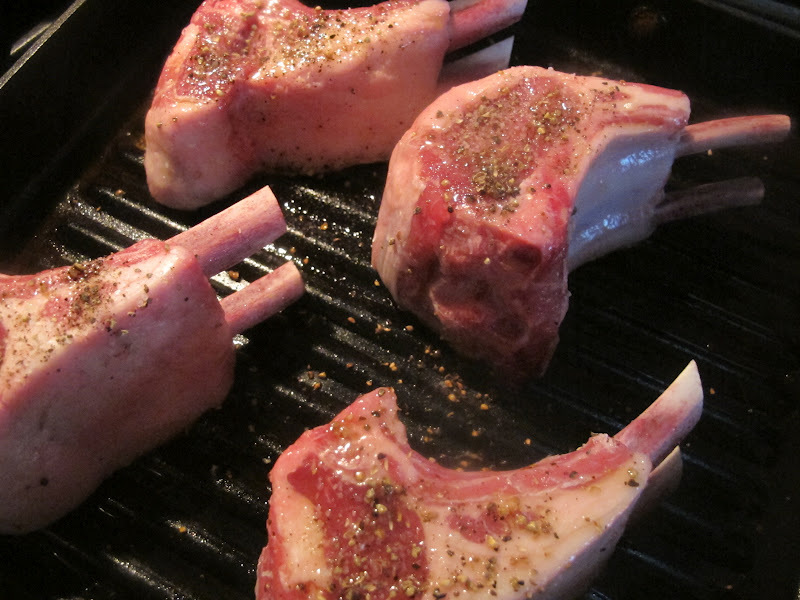 Meantime, drizzle chops with olive oil on both sides and salt and pepper thoroughly on both sides. Brown chops very well on each side and remove to a roasting pan or oven-safe casserole. When all the chops are browned, place pan/casserole in the oven and roast until done to your liking. Use instant-read thermometer to determine if chops are done. I like mine fairly rare (quite pink) and took them out to rest when the temperature was between 120 and 125 degrees Fahrenheit. 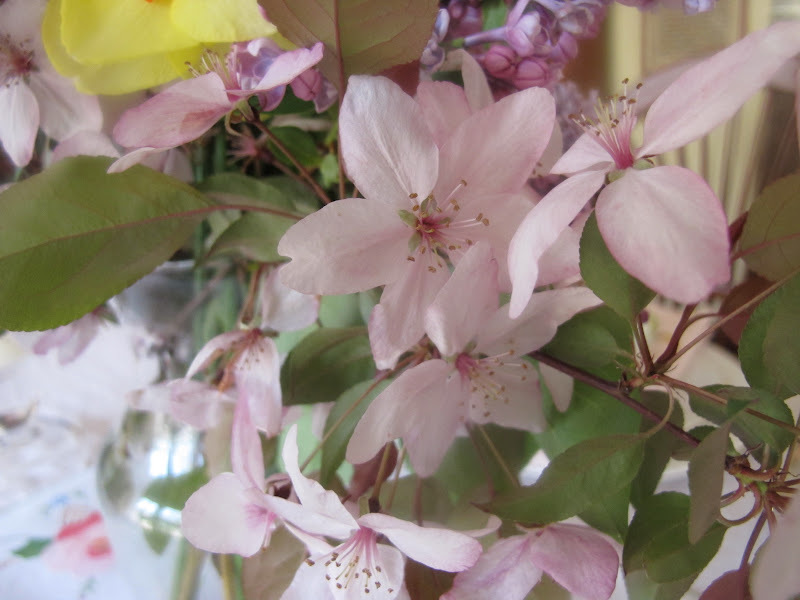 If you’d like them just pink, try 140 degrees. Quite done is about 160. Remove pan/casserole from oven and remove chops to serving platter. Let sit 2-3 minutes. 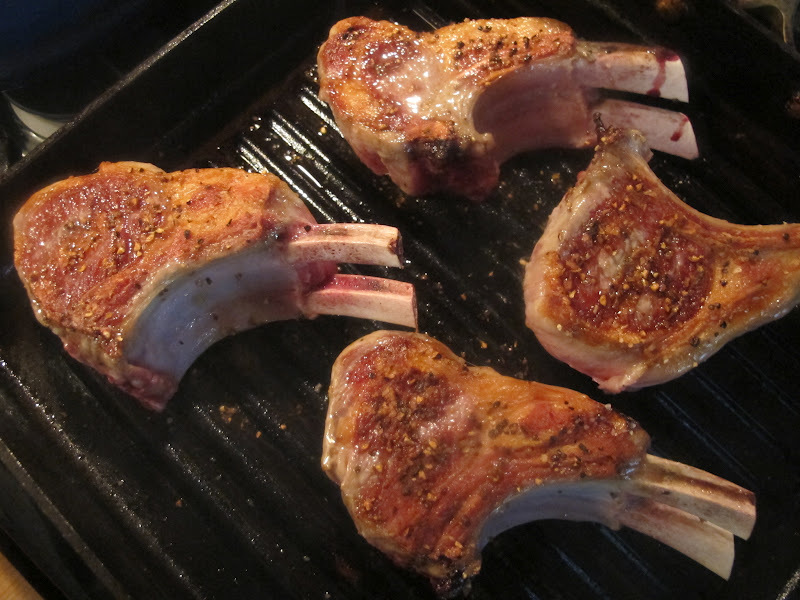 Note: If you’d like to use nice big and thick bone-in pork chops instead of lamb chops, they’ll work just as well using the same process. You’ll want them cooked to 145 degrees Fahrenheit (medium rare) and allowed to rest a few minutes. Great with tapenade.